Hi, my name is Dave and here at G Spotter Antennas we have been helping with wireless broadband internet and mobile phone communication solutions and advice since 2007. Welcome to our testimonial page, We don't activly solicit feedback, however from time to time people send us their thoughts. The following are some of the testimonials from our clients who wanted to let us & others know what they achieved with our products and further information on some interesting projects using our G Spotters. Call me on 0418186895 or use the online contact form if you have any feedback or questions about our of 3G 4G 4Gx 5G + LTE & WiFi antenna range. Thanks again Dave, the "G Spotter" boosts my 4G signal from 2 bars to 5 bars (max) and data speeds are almost double = I have it installed already! 500gig of 4G internet for $80 with Optus. I have attached some pics of speed and signal gained with the G spotter. 'We seem to live in the Bermuda triangle of internet however time and time again I have rung Dave and not only does he remember me and my installation but can answer my question in 60 seconds. Don’t waste hours on the phone to the Optus and Telstra call centres as Dave knows his gear and the latest offers and can point you in the right direction. His information and advice is always spot on. Hi Dave, So thank you very much you've managed to supply us with something the Telco providers couldn't or wouldn't. I mounted the True Blue on a pole on the roof as per the photo I sent. I wanted to give a week or so trial before letting you know how we got on. We've still on two signal bars on Optus router sometimes three. 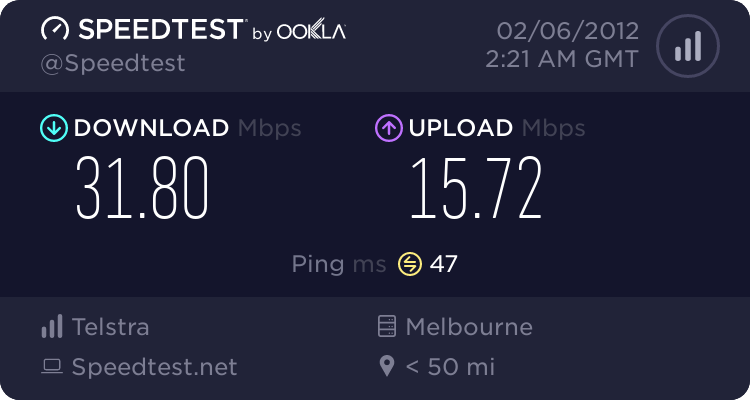 As you indicated, speeds have been fine in comparison to our satellite NBN with active8 and I have not have any of the family tell me otherwise. Chad Mitchell - Mungalup - W.A. If it’s good enough for Federer, it’s good enough for us. Live-streaming from anywhere any time, even in the middle of the desert, metres away from where Roger Federer visited a few weeks back. That’s right – today we’re testing our network in the Pinnacles for a show later this year. Under normal conditions you’d be lucky to get any type of mobile connection here, but thanks to Dave at www.broadbandantennas.com.au we’ve got a reliable uplink by using their True Blue MiMo LTE antenna. Highly recommend chatting to Dave if you’re in the country often without a signal. I am able to use the mobile phone any where in the house via wifi calling, I am able to watch Netflix, study on line at University and listen to the radio via apps. In this area there is little to NO mobile coverage....... “no service rather than SOS” is the norm. The dangers of not being able to call in the case of an accident is obvious. This technology and infrastructure goes along way to lessening the isolation that can become a significant problem for people living in the country. 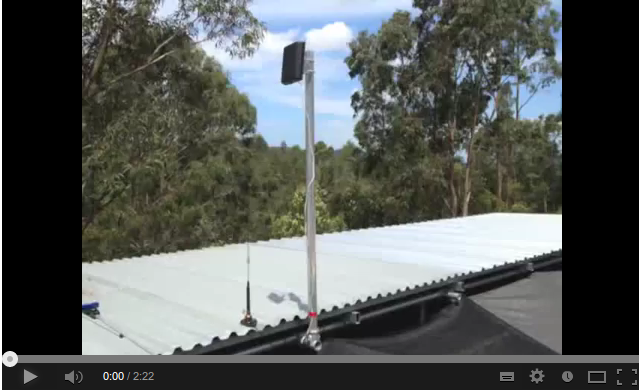 “Hi Dave, installed the twin peak pro and the Telstra inline Mobile Repeater/Booster. 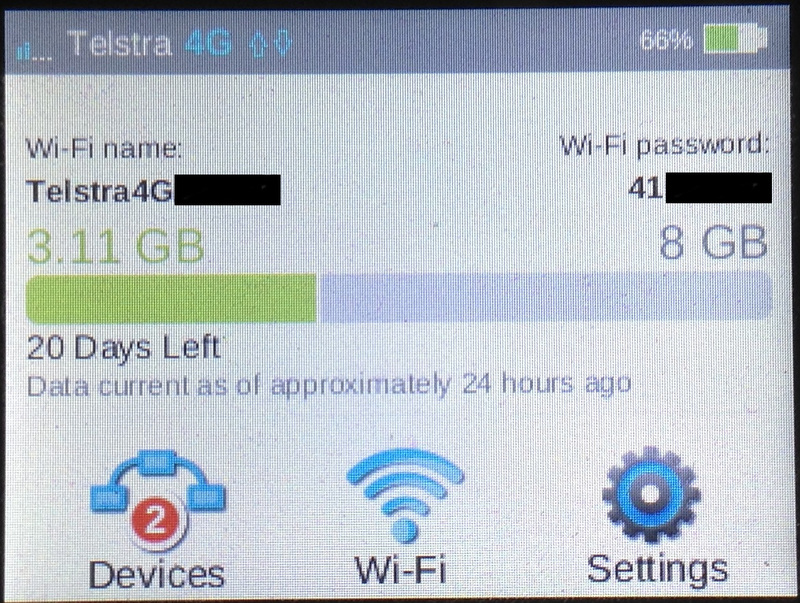 I have gone from intermittent marginal 3G with Telstra to almost full strength 4G. I haven’t bothered to tune the antenna using the app because my service is fantastic with me just pointing the antenna in the general direction of town. 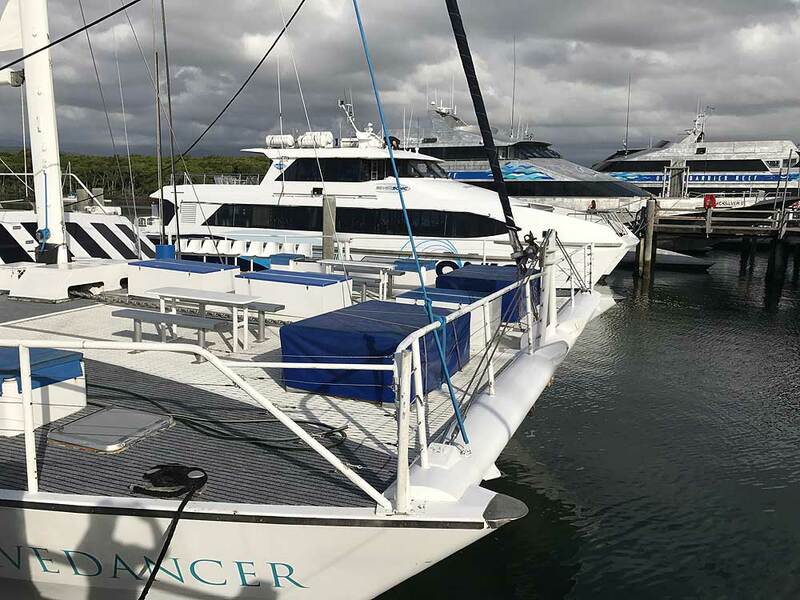 I installed the whole system externally and mounted the booster on an external wall under the verandah for weather protection. I am getting data downloads in excess of 20Mbps. Hi Dave, All went really well at the National Native Title Conference last week in terms of the wireless connectivity and overall running of the event!! On behalf of the Kimberley Land Council and AIATSIS we would like to express our Gratitude for all your support and professional insight, also for arranging the prompt delivery of the required wireless hardware that supplied connectivity for our event staff and 800 or so delegates. Arun and I were really impressed with the range we were able to receive using the dual high-gain antenna setup. It was a pleasure dealing with your Business and we will certainly be reaching out to you again soon no doubt!! Hi Dave, I just wanted to give you some feedback on my experience using the Twin Peak Pro antenna. 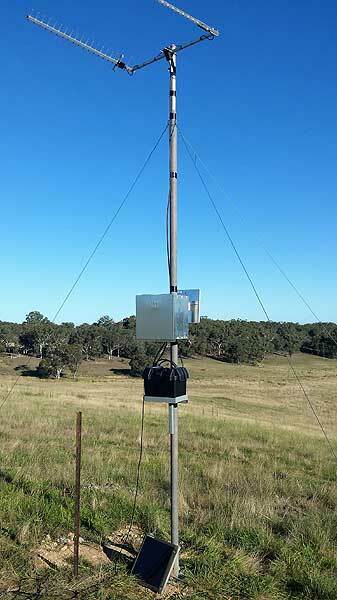 Last weekend I setup the Twin Peak Pro Antenna to provide phone and internet coverage in Quialigo NSW.. I had my doubts that I would receive a 4G service at a all down in the Valley, and 3G would be the best I could hope for in such a difficult location. Now I am getting around 15 Mbit of solid 4G, paired with high gain wifi antennas, I can use the internet and make wifi calls around the property. I have supplied a picture of my install for you to have a look at. Thanks once again for supplying a fantastic product which is going to be loved for many years to come. 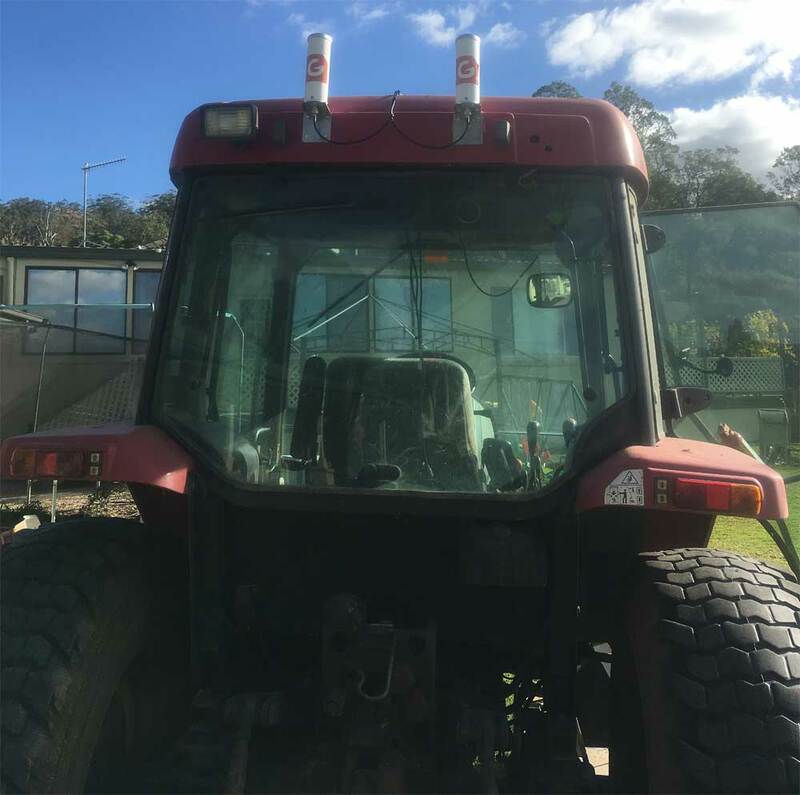 Using 2 of the Stubby G Spotters on the Tractor on the Farm in Theresa Park NSW has embled Chris to access super fast 4G even when the tractor was on the move. 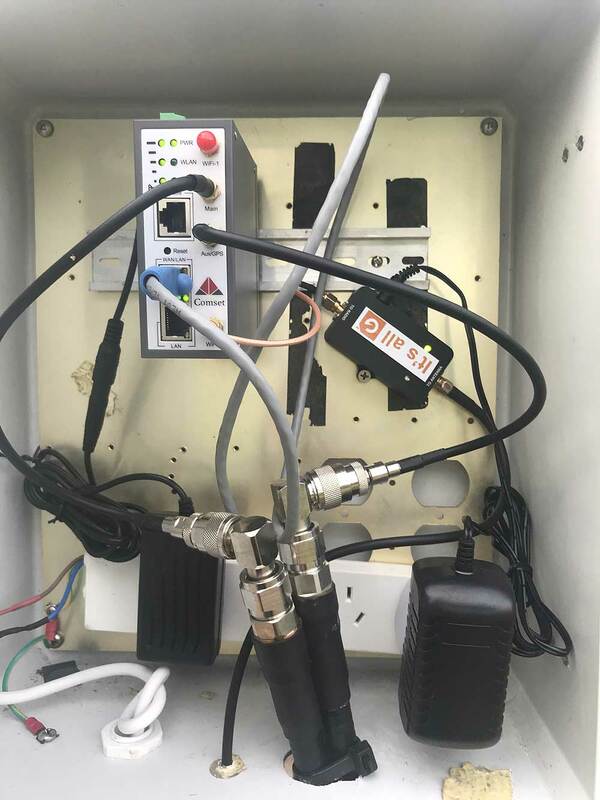 The use of 2 antennas enables signal to the modem from the tower and now due to MiMo technology the modem can utilise the 2 antenna ports for better and faster reception. Using your phone with WiFi Calling enabled means that mobile calls are also not a problem. Far better than the old days of 3G & cradles that would loose too much signal. Hi Dave, Happy to report that I set up the Twin Peak Pro on the weekend and... instant 4G service! Spent another 15mins finding the best tower/signal strength which ended up being the tower at Somerset Dam. This aerial was a game changer for my property as I went from having zero service to 4G. The daughter is happily watching youtube videos!!! 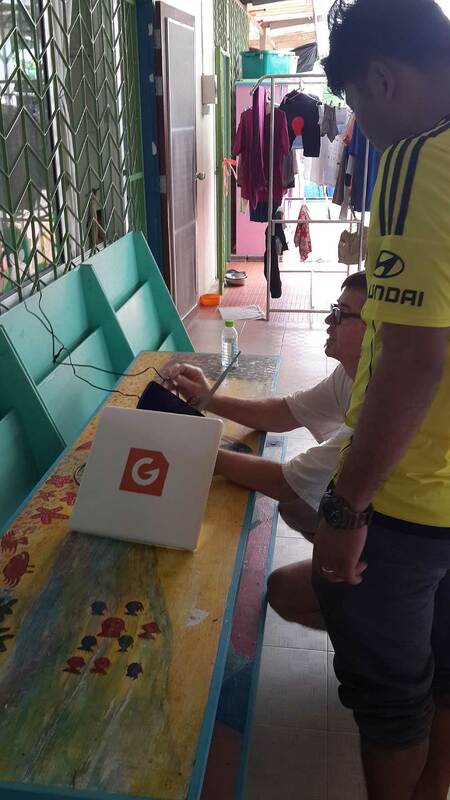 Thanks to G Spotter Antennas our remote part of paradise has super fast 4G and extended WiFi. 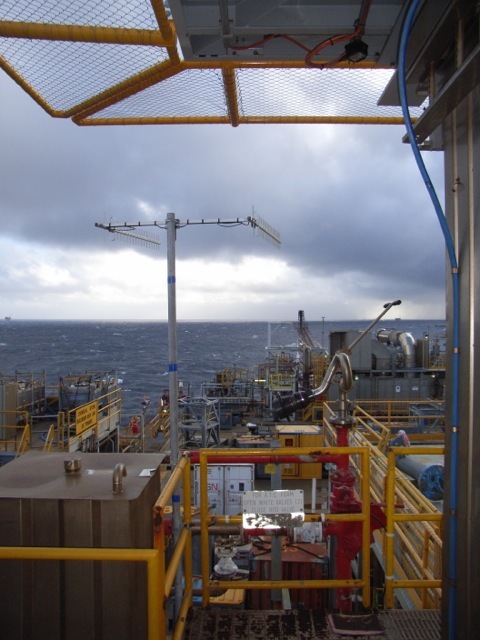 Dave and G Spotter Antennas supplied all the necassary equipment including 2 X High Gain Commercial 1800MHz Antennas with Heliax Cable to run 50Mtrs down to a Comset Duel Sim Router. 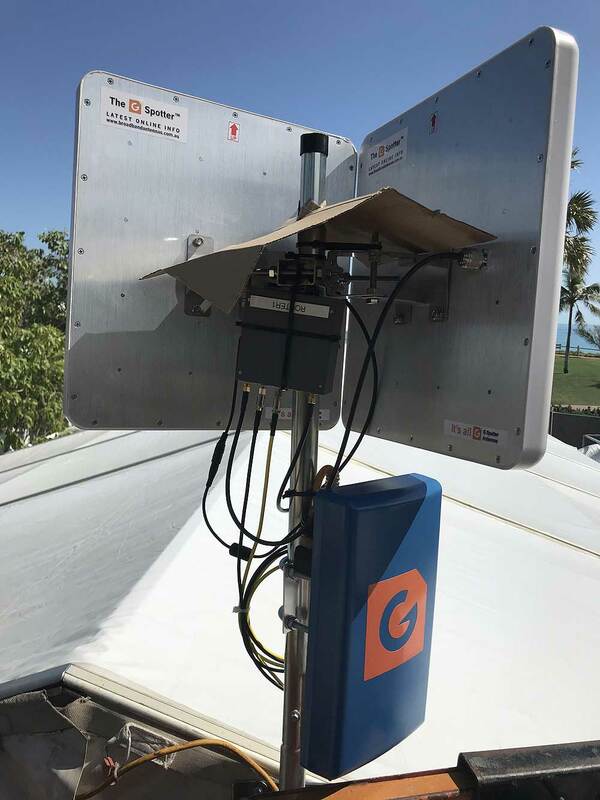 Then on the WiFi rebroadcast side 3 Super Maxi G Spotter WiFi Antennas and repeater were used to create a huge wireless footprint on the island. Thanks dave for all your knowhow & assistance on this large project. Dave The True Blue antenna coupled with the WIFI antenna we purchased through you has been great. Easy to setup and the improvement to our internet and phone has been incredible. Thank you once again. We are glad we found your website and your help steered us to an economical and superior solution. 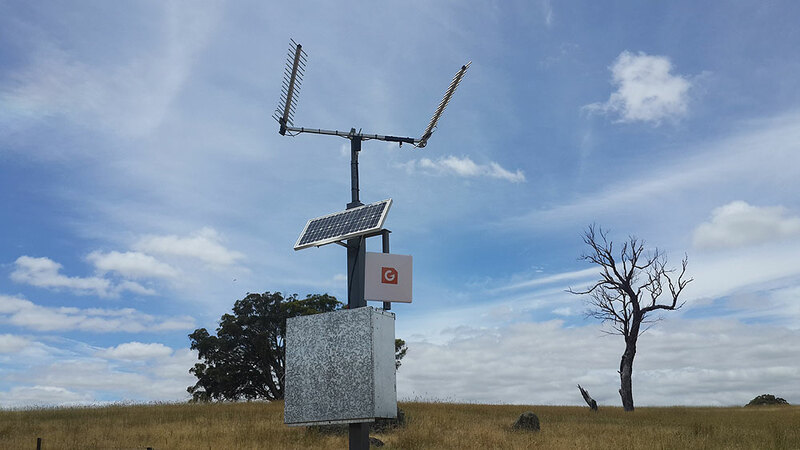 The G Spotter Portable 4G High speed WiFi Hotspot was deployed at the recent Taralga Bushfires. For weeks the Hotspot provided reliable internet to the team running the fire. 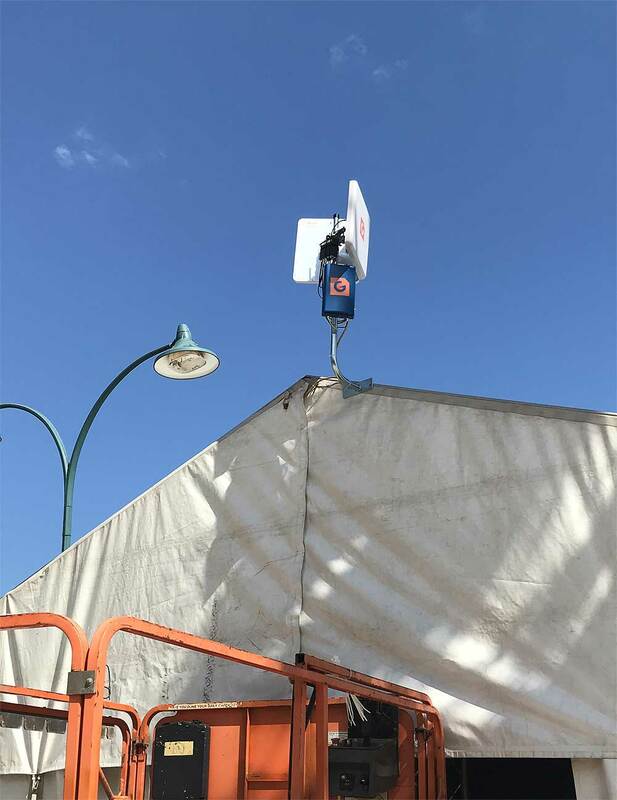 The Quick Deploy unit can provide duel carrier high speed wireless broadband internet over 700mhz and re-broadcast WiFi over a large area. with minimal power usage. We are more than impressed with the quality of the products supplied by Dave from G -spotter and Daves fantastic customer service. As a result of installing his system we have been able to achive data speeds we have never seen before and only ever dreamed of. Satellite vs G spotter the G spotter system wins hands down. If your in an area where there might be signal or you have weak signal, give Dave a call his advice, honesty and research will give you the answer. 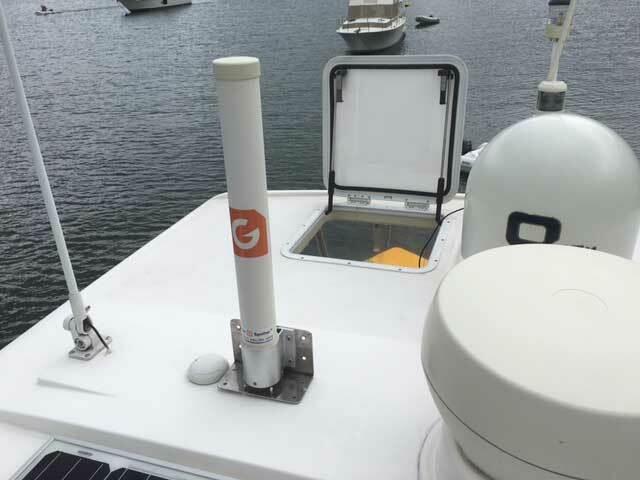 G Spotter Antennas fitted to the fleet of Quicksilver vessels. 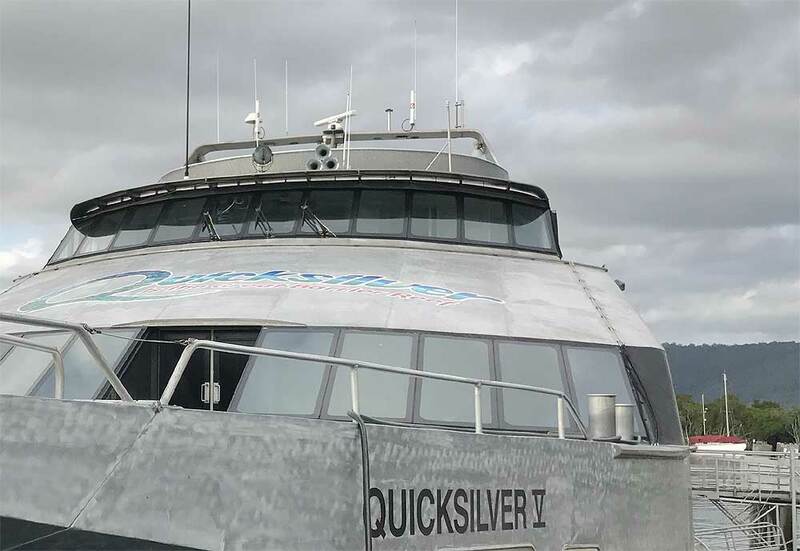 A pioneering reef tourism operator, the Quicksilver Group is Australias leading Great Barrier Reef cruise company and one of North Queenslands largest private employers and 13 major vessels. 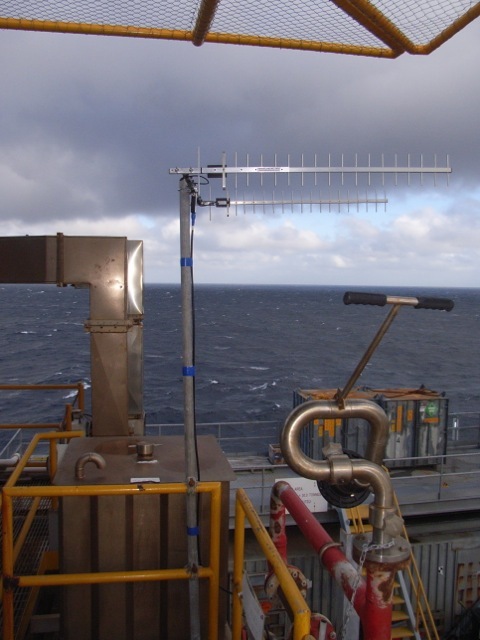 Duel 69er G Spotter antennas were fitted along with the Comset Commercial Duel Sim Modem to increase 4GX signal to the vessels while offshore. By using Duel 69ers a far better reception was received owing to the MiMo qualities of G Spotter Antennas. Dave has been great and I can't recommend him enough, he has helped us twice. The first time was with our optus homewireless broadband... our service wasn't great and a quick phone call to Dave and a G spotter True blue aerial and it worked beautifully. When we upgraded our wifi to the Vivid inlimited I made another call to Dave and following his advice again moved our g spotter aerial and the service issue was fixed. I bought these G-spotters back in April to provide external antenna feed in to my mobile broadband wifi router. 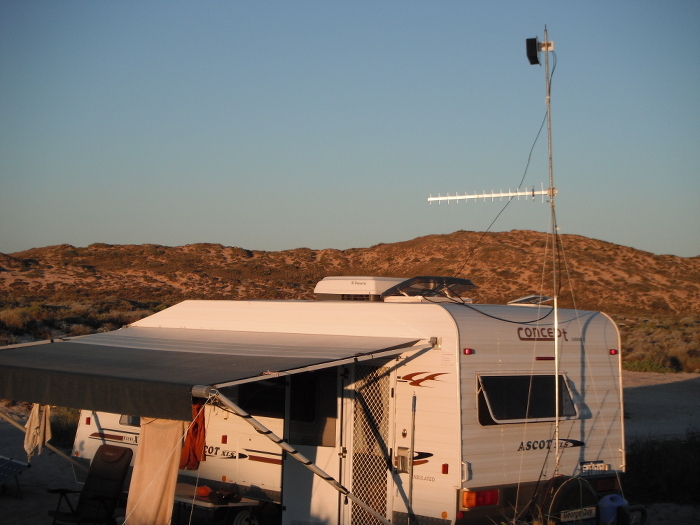 It has worked great sofar and mate do I get a lot of questions from other campers.....not one camping spot where they have not asked me :"What is that on your roof" You may sell some extra antenna's ;-) Thought you might like to hear a good story. 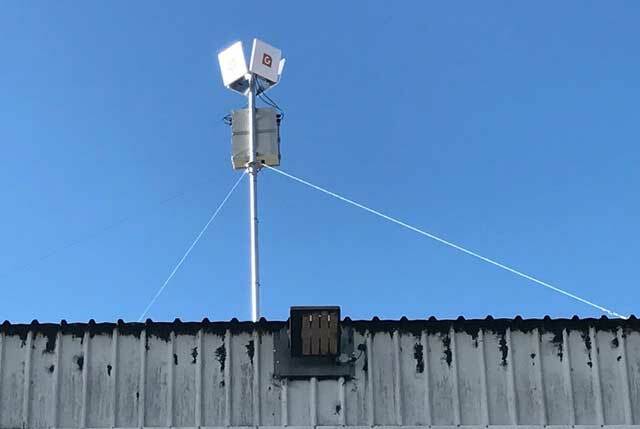 Looking for a reliable solution for wifi connectivity on our remote processing site we came across Gspotter antennas.After a chat with Dave about our options and some practical real world examples he provided. We went ahead with a 4G wifi solution . This has been in place for 4 months and has worked seamlessly providing reliable wifi, call over wifi options (on capable devices) and connectivity for site computers and machinery. The feedback from site staff has been great and this has made a great impact on how their day to day tasks are performed. Finally all my changeover problems have been sorted, all systems are working and PBX is back online. Time for a little reflection on your assistance. There is no doubt that without your involvement in this setting up of this 4GX, it would never have happened so soon. I guess eventually I would have stumbled on the correct components and methods, but when you are stuck out in the country in a town totally deprived of any technical competent person, (except me of course), it is difficult to get your information together. I had been waiting for 4GX to arrive here, being a Telstra backwater it did come some 2 years after it arrived everywhere else. When I saw it was near enough to my house I thought it was time to try and pick up the signal. So the next step was to find an antenna that would do the job, so out to search the Internet once again and see what was available. This was the first time I had ever bumped your website, and was immediately blown away by your video of the install 35 kms from Goulburn. I was most impressed with the speedtest you did on that video, and found the speeds quite unbelievable. Mind you I never believed I'd get them here. After talking with you and taking on board the many things you enlightened me with regarding the 4GX technology, and your belief that if I could get 3G where I was then 4GX was more than possible. According to the Telstra coverage maps I was still well outside the 4GX coverage area. So armed with your brilliant Twin Peak Pro Antenna, a new Telstra Home Wireless Broadband plan, new Modem and Netgear cradle, I proceeded to implement the changeover to 4GX. Being a change of IP gateway from 10.0.0.138 to the new 192.168.100. that caused a few problem which over a few days were all sorted. So thanks to your assistance, brilliant technical support and amicable and friendly service, I now sit here with, more times than not, a connection speed of 27 Mbps Download and 27 Mbps Upload. 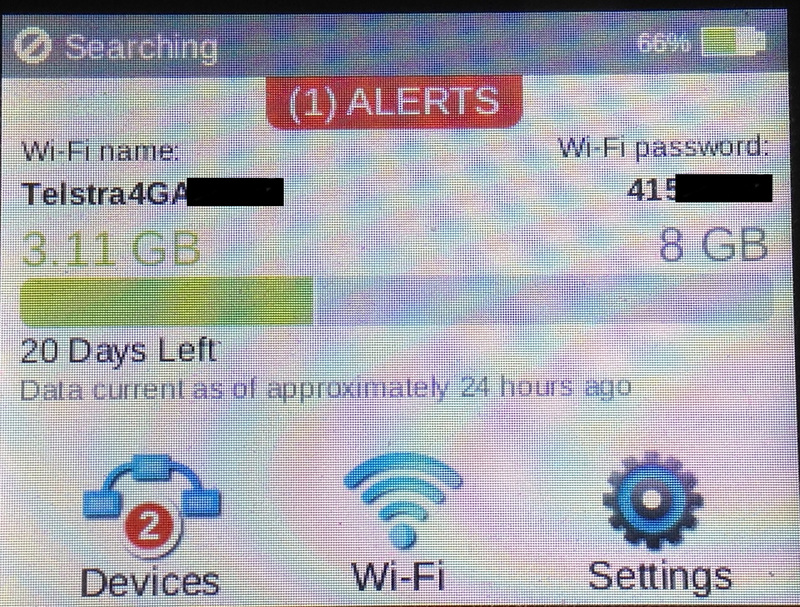 I hope it lasts, unlike my 3G which started out well but turned to drain water after a few years. I can't quite get over the change and spend considerable time just watching the speedtest. Might take me a while to give that up having never seen a speedtest go over 1 Mbps, (yes that is one), on my 3G. So Dave, thanks for your assistance and answers to all my queries, I hope you are still around when we move to 5G. 20 Gbps per second, so I read the other day. That's Gigabits I didn't mistake the G for the M. Regards, Patrick. With no internet reception available near the house, 4G Plus Optus signal using the Twin Peak pro, was achived from a tower about 50k's away. 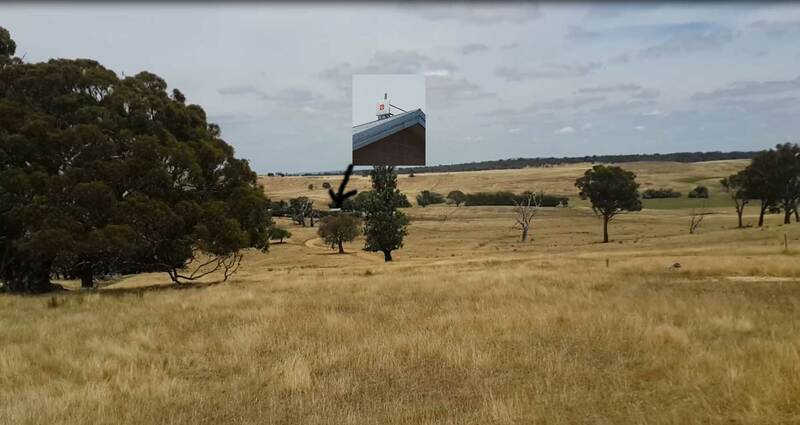 From this spot a G Spotter Maxi Gain WiFi panel antenna transmits the signal over 700Mtrs to a shed where a WiFi Extender with another 2 x G Spotter Maxi Wifi antennas were used to increase the WiFi signal around the yards and to the homestead some few hundred metres away. There was never any mobile coverage at the property but now there is full internet access around the farm with the fast 4G optus network. 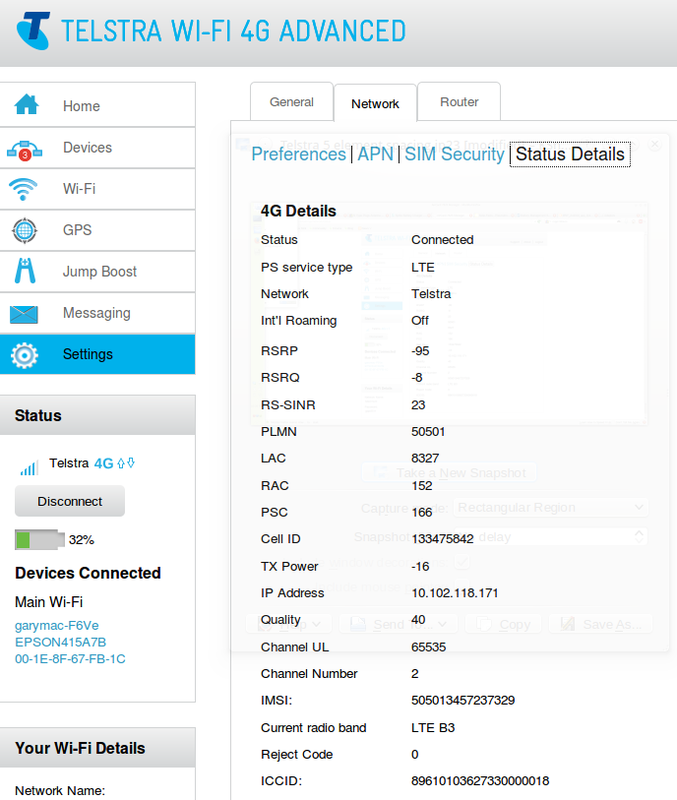 Also the Optus WiFi Talk app can be used to receive normal phone service over the large WiFi coverage area. 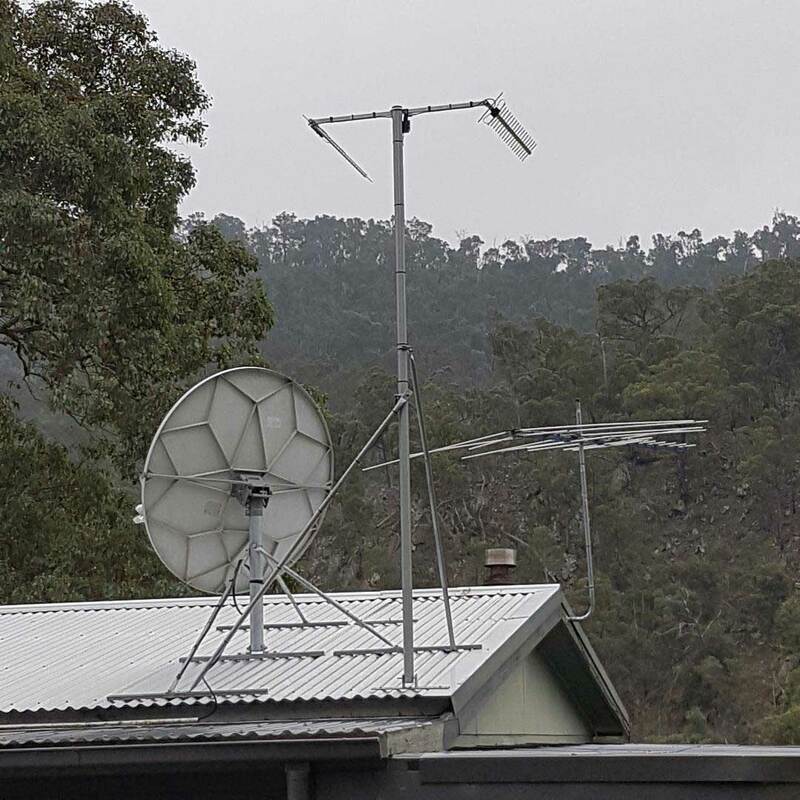 With no internet available near the house at their Bannaby property Iain Mckay managed to find signal about 300 mtrs from his house. He connected a Twin Peak Pro to the Optus Home Gateway that he gets 200Gig of fast 4G data per month for $80. The Optus Tower is near Moss vale about 55K's away. He then attached a TPLink router and a G Spotter Maxi High Gain WiFi antenna to broadcast the signal down to his house and surrounding padocks. At the house a WiFi Extender with another 2 G Spotter Maxi Wifi antennas was used to increase the WiFi signal around the home. 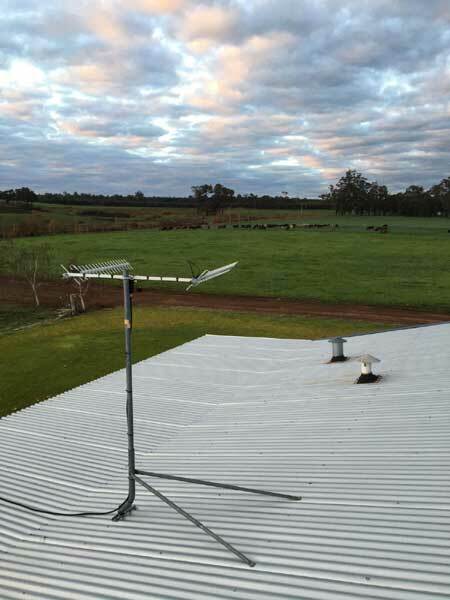 Iain now has full internet access around his farm with the fast 4G optus network. He also uses the Optus WiFi Talk app on his phone to receive normal phone service over his large WiFi coverage area. 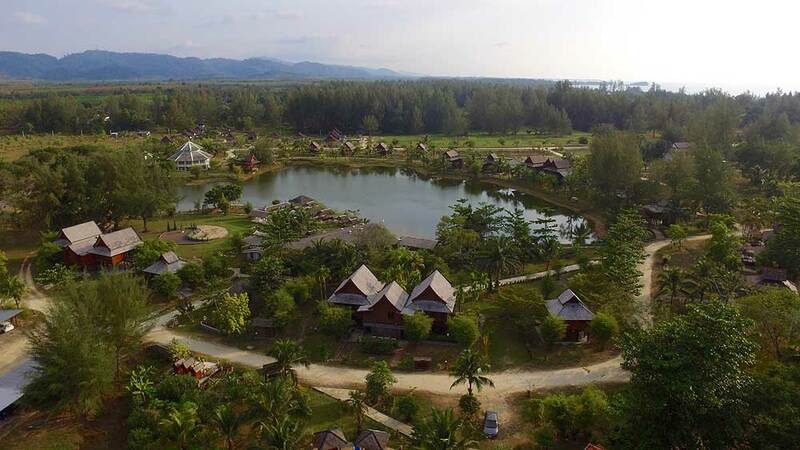 Baan Tharn Namchai is an Orphanage set up after the 2004 Boxing Day Tsunami. 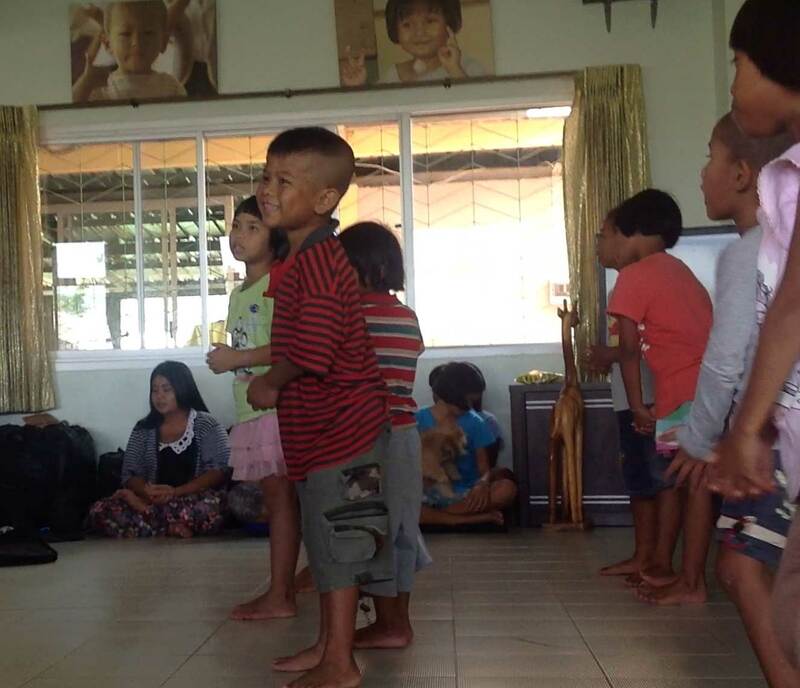 It is located near Takua Pa in Southern Thailand and currently there is over 100 children who live there. 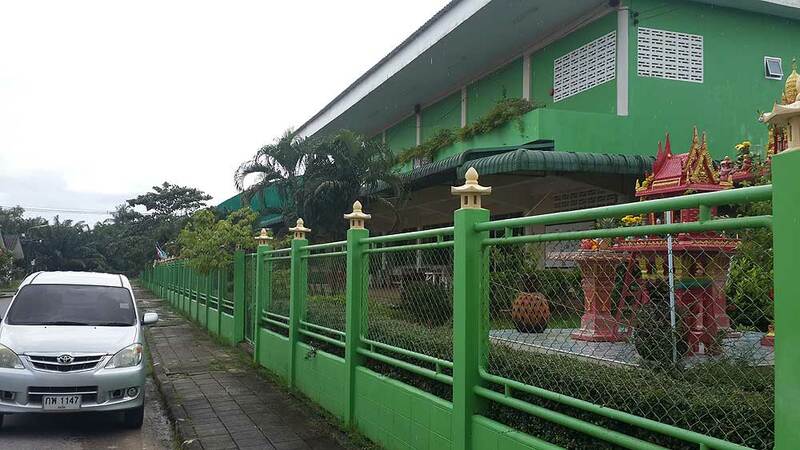 Over many years our family have volunteered in at the orphanage, by teaching English, computer skills and helping where we can. 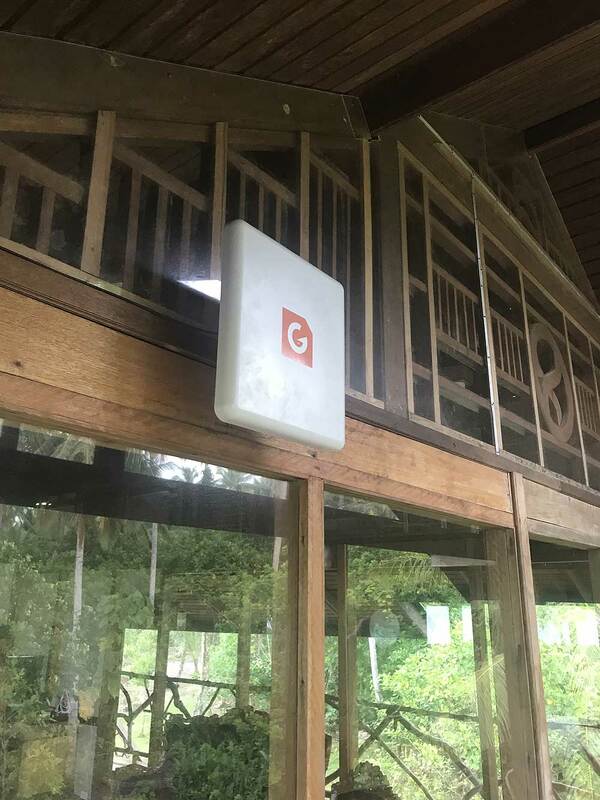 In October we took some of our G Spotter Maxi Gain WiFi antennas and set up a large WiFi network around the Orphanage which extended to the new Classroom and Library. With the new enhanced WiFi area the use of iPads and other tablets will make it much easier for the kids to undertake English lessons and improve their computer skills. 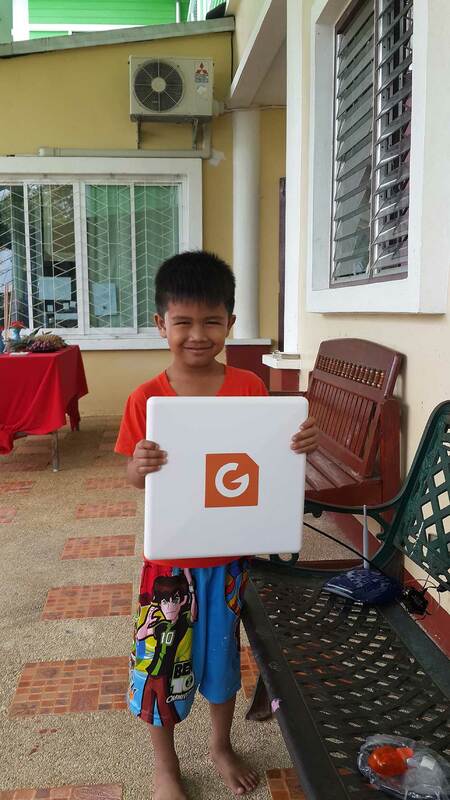 At the moment they have only a few ipads, so our next step is to raise some money to supply more tablet and ipad type devices to use on their new WiFi area around the Orphanage. Baan Tharn Namchai in March 2017. Hi Dave. After testing the Omni squat over the last 2 days I have come to the conclusion that the police should be called. Fancy stealing a signal out of thin air.It should be a crime. I have no idea how you make these BUT they work like a ripper and I will be recommending to all my friends down the coast. Before setting up the Twin Peak Pro and Cel-Fi Pro, we only had access to 3G. It was almost impossible to send and receive emails, let alone trying to look stuff up on the net. At times we couldn't even make a call on our mobiles. We have now had a network tower approx 8 km from us upgraded to 4g. I now get 4-5 bars reception on the Cel-Fi, and download and upload speeds are sensational. Thanks to Dave for his help in getting us hooked up to decent speeds in a rural area. With no internet available near the house Angus managed to find signal about 200 mtrs from his house. He connected a Twin Peak Pro to the Optus Home Gateway. The tower is over 50K's away. He then attached a TPLink router and a G Spotter Maxi High Gain WiFi antenna to broadcast the signal down to his house and surrounding padocks. At the house a WiFi Extender with another G Spotter Maxi Wifi antenna was used to increase the WiFi signal around the home. 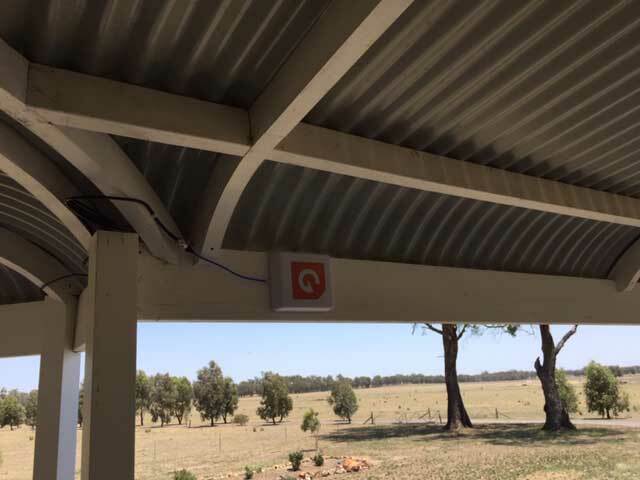 Angus now has full internet access around his farm with the fast 4G optus network. He also uses the Optus WiFi Talk app on his phone to receive normal phone service over his large WiFi coverage area. 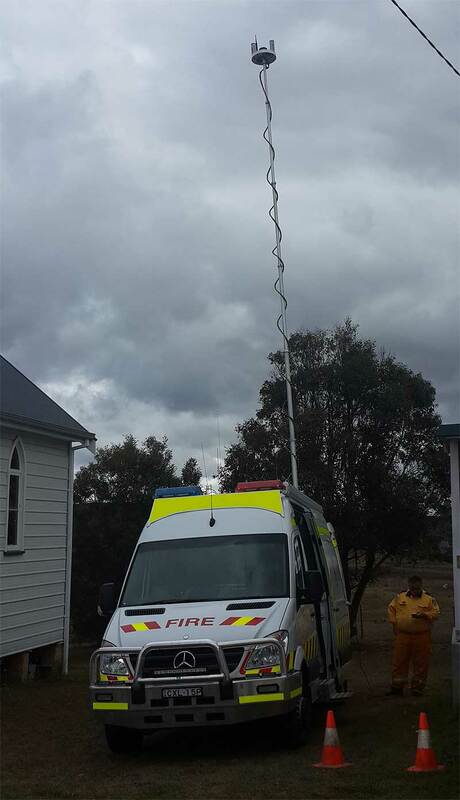 G Spotter Stubby antennas along with our Maxi Gain WiFi antennas have been used onboard the NSW RFS Forward Operational Van to assist both during Bushfire Season as well as with Community events such as the recent Hotspots program run at Nerriga. 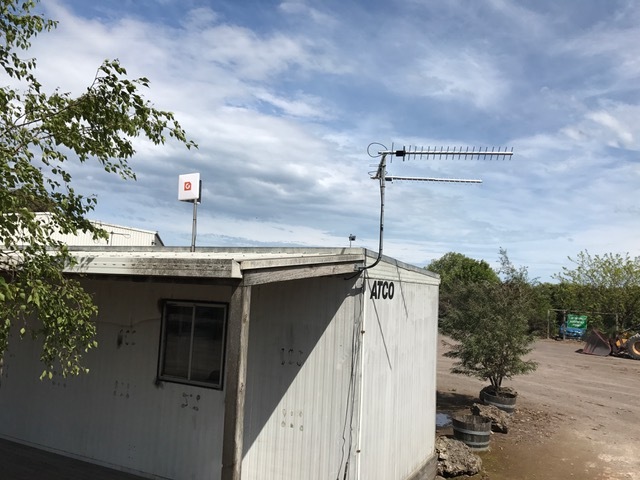 Using the G Spotter MiMo Sttuby antennas to receive High speed 4g signal from over 40'ks away from a tower, the powerful WiFi panels were able to provide high speed internet signal into the community hall. 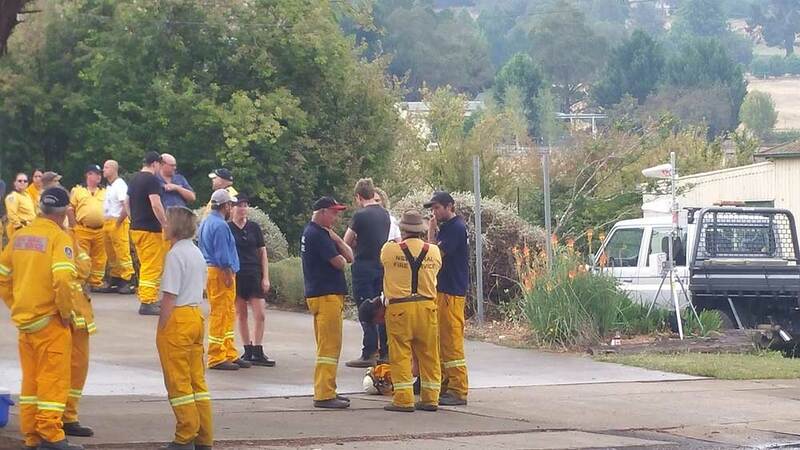 Locals were then able to operate 8 laptops to complete their online Bushfire assesment. 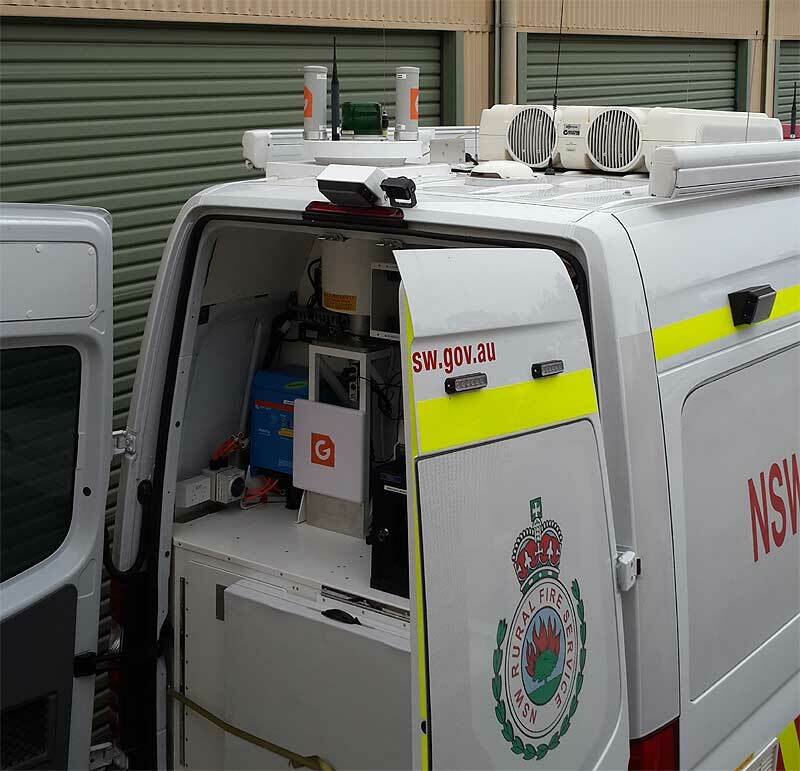 Using 2 G Spotter Stubby antennas, State Medical Assistance (NSW) can now access fast 4GX wireless broadband and also create a large wireless Hotspot for WiFi devices around their response vehicles. 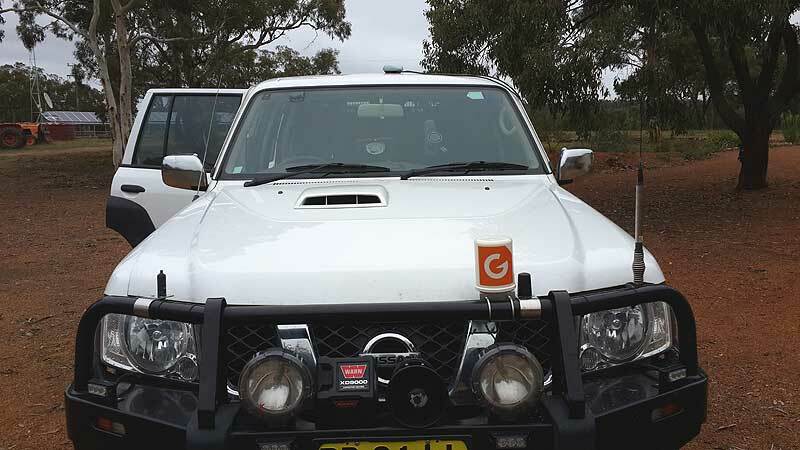 Hi Dave, The 69er Bullbar Mounted & ready to go. Fast 4GX internet on the Road. 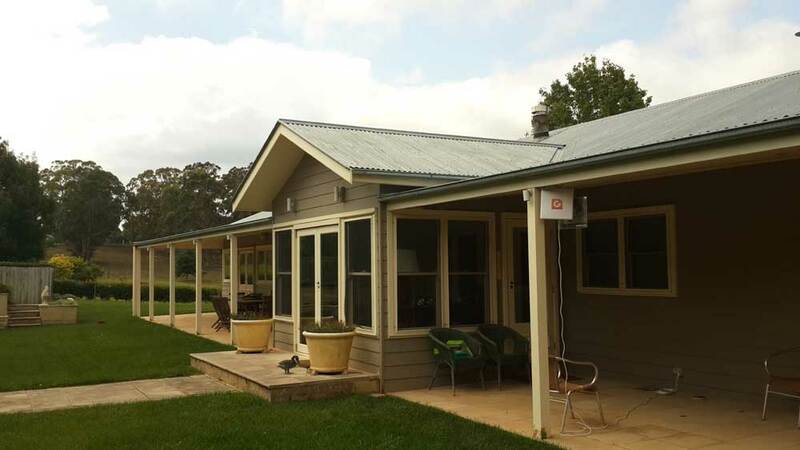 Hi Dave, I cannot thank you enough, through your advice and products I now have stable 4G wireless broadband, prior to this we had very unstable Telstra that would run for hrs with no reception creating an unreliable expensive alternative to ADSL that we have running from 0.17 - 0.34 mbps. Until now Optus was not even worth consideration, that was until the Antenna went up that you supplied, along with some sound advice I know have stable Optus 4G in Theresa Park in the valley. The picture below shows my actual reception as the result of your antenna the True Blue G Spotter. With no internet available near the house Harry managed to find signal about 250 mtrs from his house. He connected a Twin Peak Pro to the Optus Home Gateway (Giving him 50gig for $70 a month of 4G internet.) He then attached a TPLink router and a G Spotter Maxi High Gain WiFi antenna to broadcast the signal down to his house and surrounding padocks. At the house a WiFi Extender with another G Spotter Maxi Wifi antenna was used to increase the WiFi signal around the home. 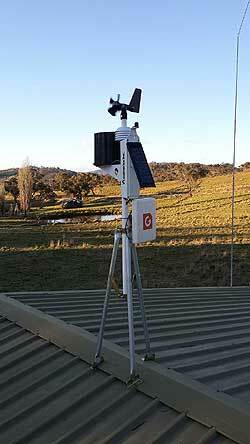 Harry now has full internet access around his farm with the fast 4G optus network. He also uses the Optus WiFi Talk app on his phone to receive normal phone service over his large WiFi coverage area. 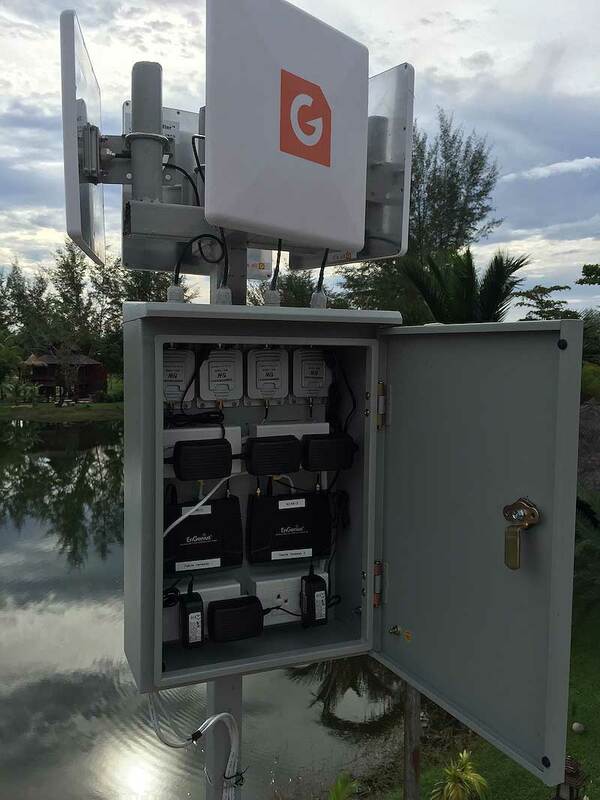 Thai Life Resort in Thailand set up 4 G Spotter Maxi Gain Wifi antennas to provide a large WiFi coverage area around the Resort. 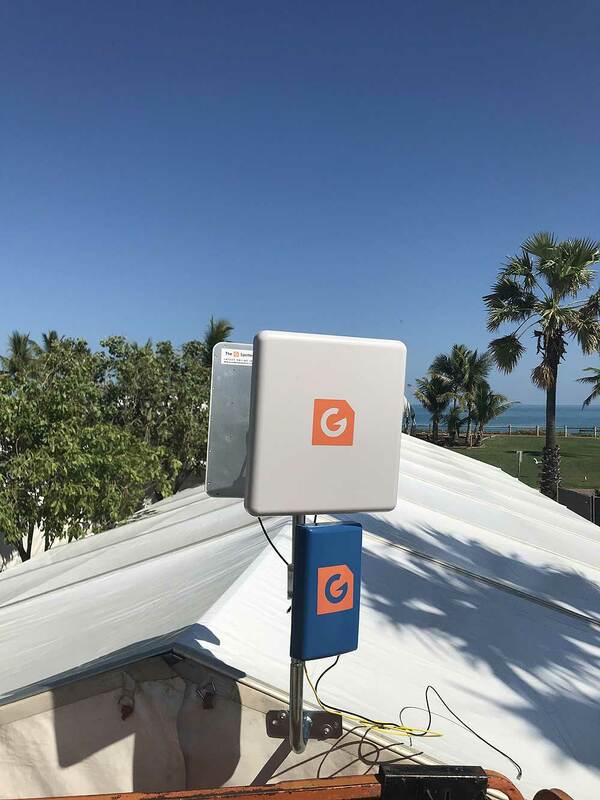 Setup over the busy Christmas tourist season, guests were able to have gret internet coverage all around the resort, thanks to G spotter antennas. 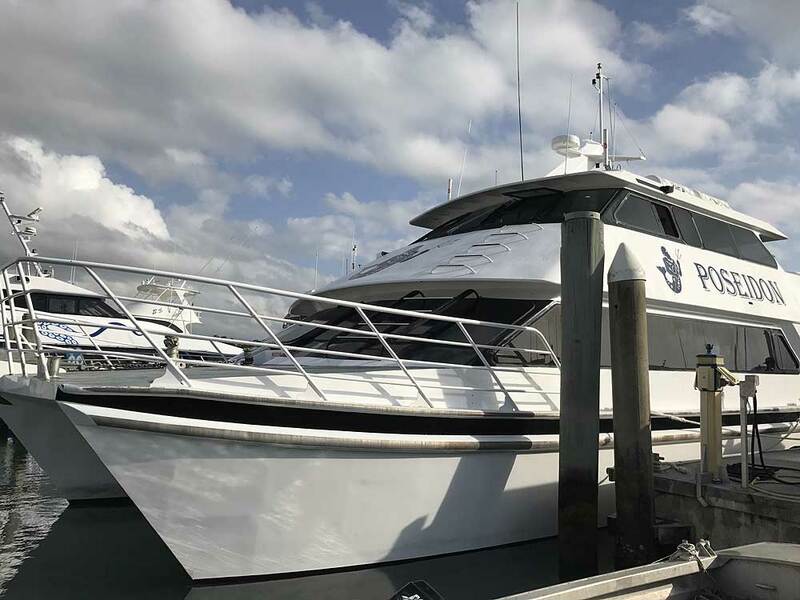 Hi Dave, Here are the shots of the 69er mounted on the boat. getting great results and download speeds on Telstra 4GX. So good I am ordering 3 more for other club members. 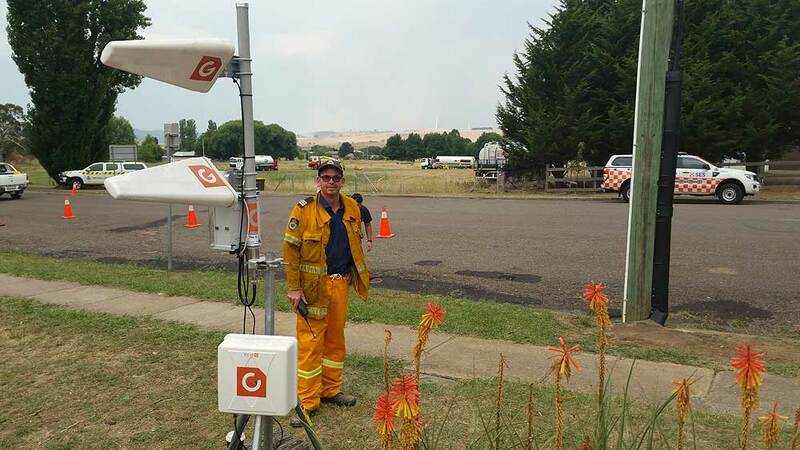 RFS Volunteer David Edworthy with an example piece of antenna equipment used by Rural Fire crews across the Zone to access WiFi signal in areas where even a phone call can't be made. "Dave's understanding of remote set-ups was invaluable. He got us going with a G Spotter Antenna for the mobile phone booster and a True Blue G Spotter Antenna for the Internet modem. We live on a farm about 15KM from the nearest town that has a mobile tower and now get perfect 3G and good 4G signals (since Telstra installed a regional 4G service). The True Blue is great that it can do both 3G and 4G, and the modem we use can select these automatically when the weather alters the signal strength on any given day at start up; choosing to connect via 3G or the new 4G. Thanks Dave. 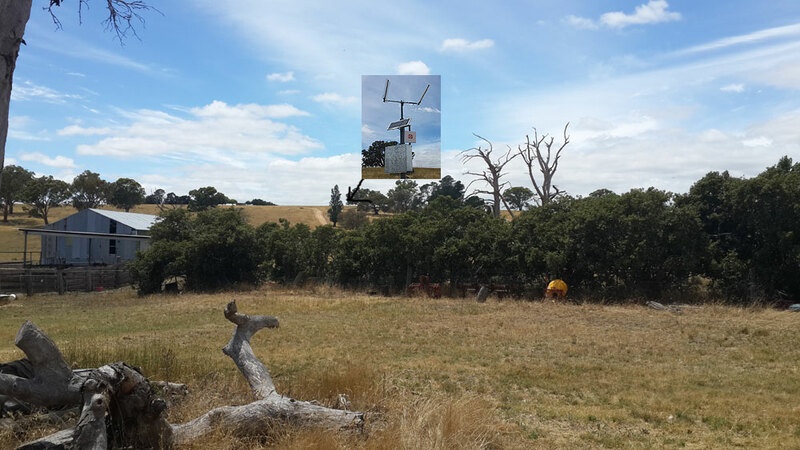 This setup used a True Blue G Spotter antenna into an Optus USB 4G modem. 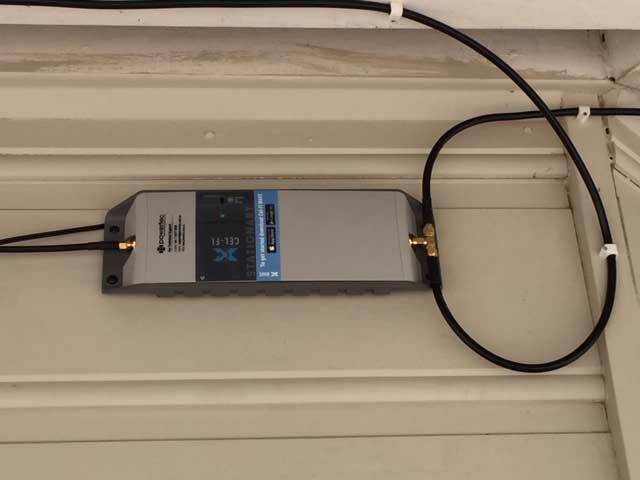 The modem was placed into a 4G Router and one of the G Spotter Maxi Gain WiFi antennas used (instead of the smaller antennas that came with the router) to increase the WiFi Signal around the property. The Optus phone using the new WiFi Talk app enables normal mobile calls & texts to be received without using a mobile phone repeater over a large area. Hi Dave, Sorry it's taken me so long to get back to you in regards to the antenna we purchased but as promised, here are the results. We tuned in our existing 14dBi Yagi and achieved a signal strength of -84db with an Ec/Io of -22 then did a speed test and got a steady 3Mbps. Then we hooked up the Twin Peak Pro and pointed it in the exactly the same direction achieved a signal strength of -76db with an Ec/Io of -17 then did a speed test and got a steady 4Mbps. Keep in mind that we are on a mine site with a 3G modem only. The results speak for themselves. Apart from that it seems to be much more stable (less up and down) than the Yagi was. So needless to say we are very happy. Thanks again. In search of a solution, he made contact with Dave Edworthy. 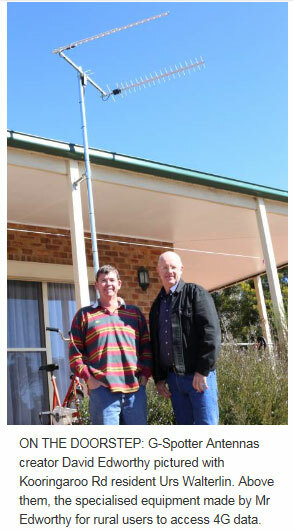 Based in Windellama, Mr Edworthy (G-Spotter Antennas) builds specialised antennas to maximise the reach of 4G towers. 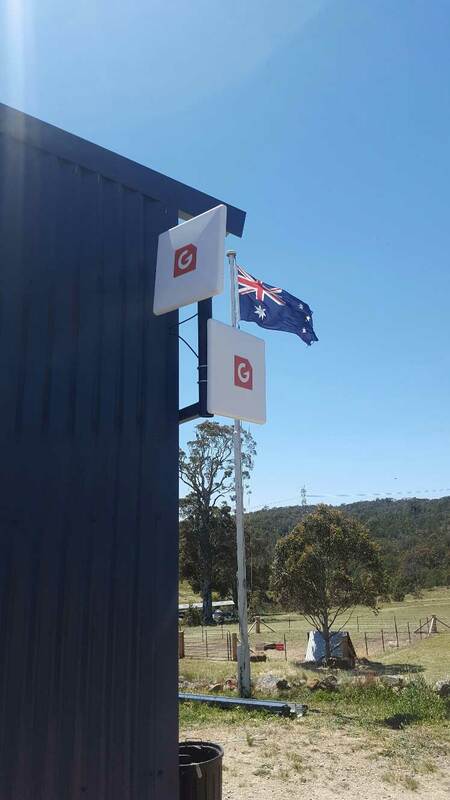 Since Optus and Telstra switched on to the 4G network via a series of towers on the 700 megahertz network (previously used for analogue TV), Mr Edworthy said fast data coverage was available for rural users. After putting up with a poor internet service on my rural property for several years, I am pleased to let you know? 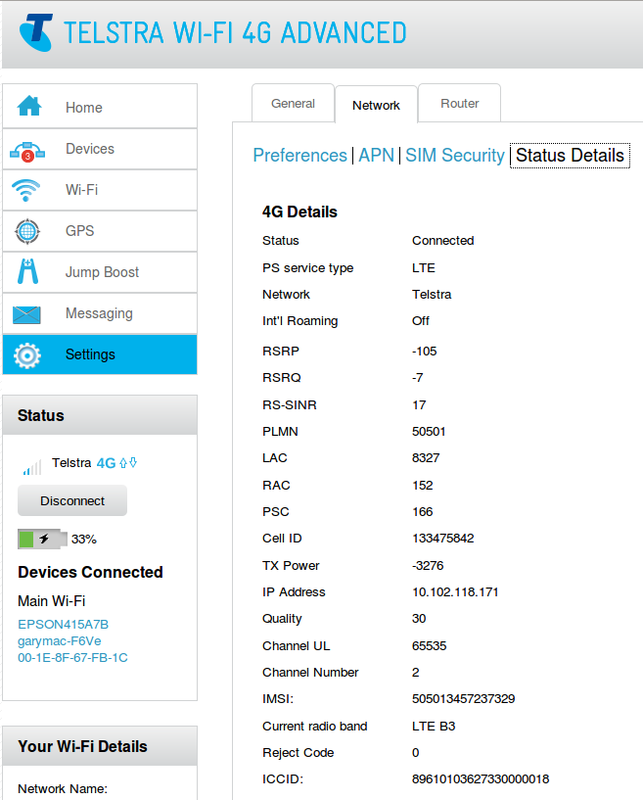 that your G-Spotter antenna is working like a charm through the Optus 4G WiFi network. The speed is excellent and the big surprise is that I am receiving signals when it is windy, cloudy or rainy. Hello Dave it's Jason from Werombi. I just installed the Twin Peak Pro and honed it in on the G spot. The antenna is amazing I've got 5 bars on my smart antenna. My mobile phone works great I can even text picture messages which impossible before and can even watch HD YouTube video's via my mobile phone ...amazing !! Telstra 4GX is now here, The following is a speed test taken using the G Spotter Twin Peak Pro 4GX with 10mtrs of LMR 400 Low Loss cable on a Netgear 790s Telstra 4gx Modem OVER 50KS FROM A THE TOWER ..I GET A FULL 2 BARS 4G (Scorching Fast Downloads & uplink) A Game changer for us in the Bush. At last i can run my business without having to drive over 100ks a day to get to a place where I can get decent Internet. Sorry for the late reply, been busy over the last few weeks. Just to let you know the Twin Peak 4GX is up and running (See attached picture) & the speeds are absolutely phenomenal. Up to 30 Mbps Down / 15 Mbps Up, on each modem at the same time. 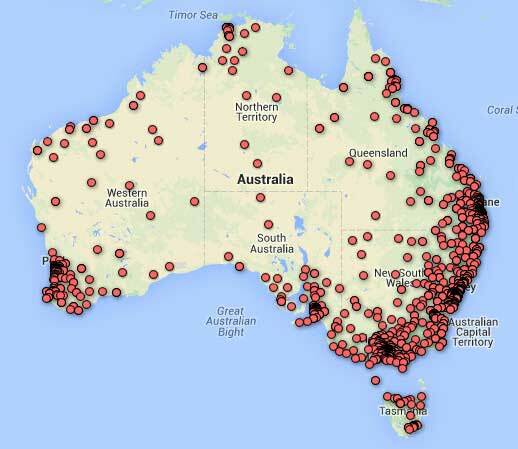 That puts my University friends in Brisbane & Toowoomba on NBN Fibre/Wireless to shame. 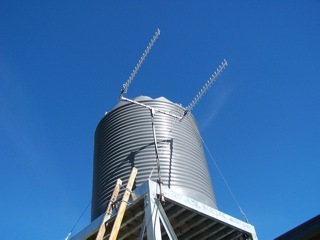 Received your 'Twin Peak Pro' antenna within 3 days; installed the next day. Incredible improvement immediately! Giving me the best internet performance I've ever had in this remote 'dead' spot! Thanks a million Dave; every bit as good as your advertising claim.. The True Blue G Spotter does work really well down in the Denmark area of WA and is great for getting Internet on the move too. With a 12v-powered wireless router and Telstra 4G mobile broadband modem, in the car, can get pretty good download speeds. 4GX IS HERE AT LAST !! 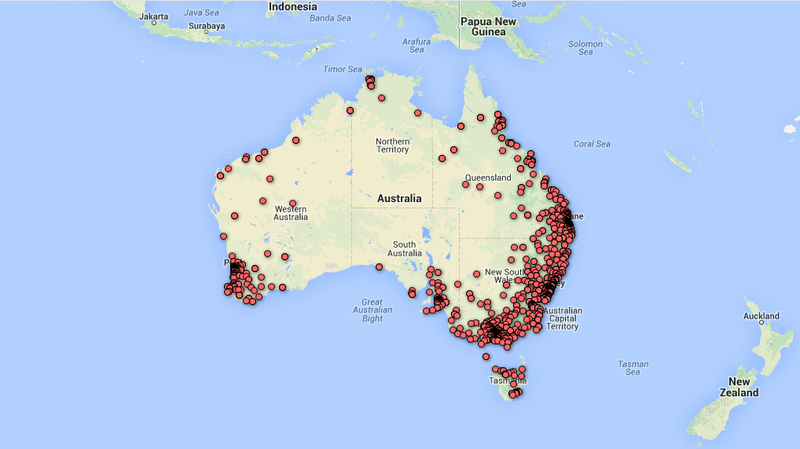 With the new 700Mhz 4GX LTE Wireless Broadband becoming available Australia Wide. 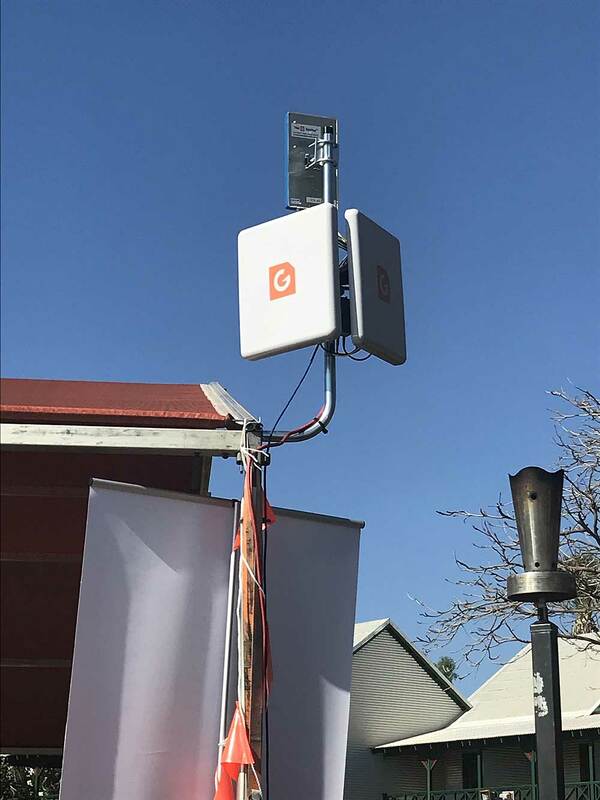 It is now possible to achieve Internet speeds the same as our city friends, using G Spotter antennas. 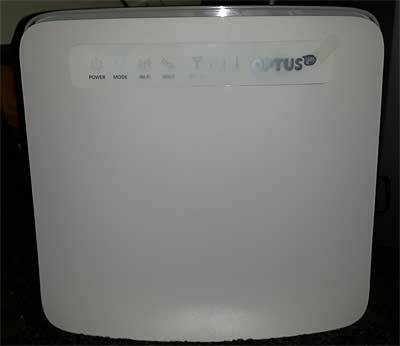 The video shows the new Twin Peak Pro antenna using the New OPTUS 4G LTE 700Mhz frequency to achieve download speeds in excess of 20Meg. 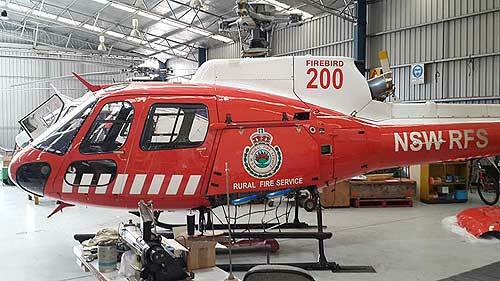 4 of our G Spotter True Blue Antennas have been fitted to the Main RFS Helicopter to enable Live High Definition Video from the fire front. The new True Blue G Spotter has been received. I have not yet mounted it properly but did test it by holding and pointing it in the general direction of the tower. The tower is about 20 kms away. I picked up 4G with 2 bars and logged a speed test at 5.63mbs. Very pleased with this result. 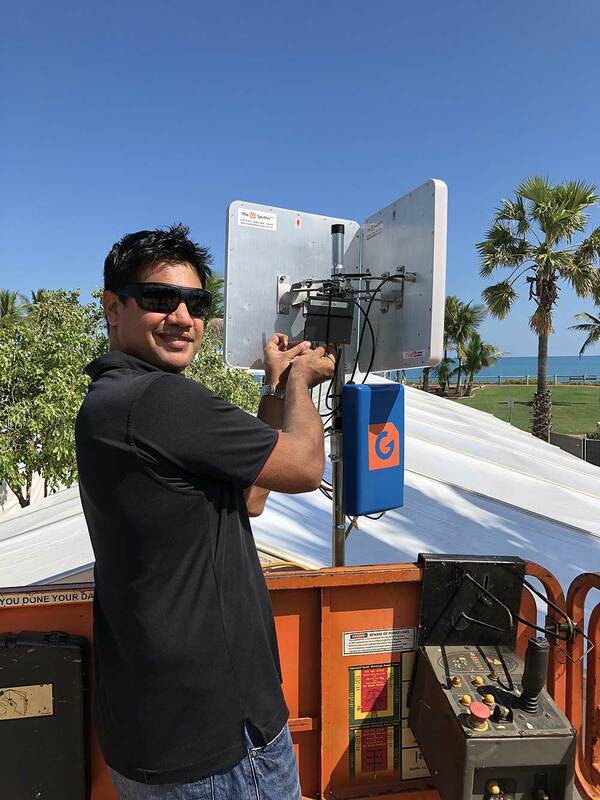 Fantastic service, fantastic product, my event this week was all in building and your True Blue Antenna took a 40% signal with 136ms latency down to 30ms with an extra 10Mbps in speed. Well done and be ordering more from you for my next projects. 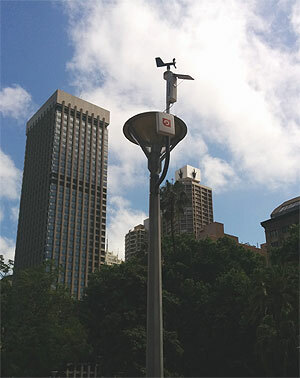 3 of the G Spotter WiFi Panel antennas and 1 G Spotter omni WiFi antenna are being used to monitor winds throughout Hyde Park in Sydney. 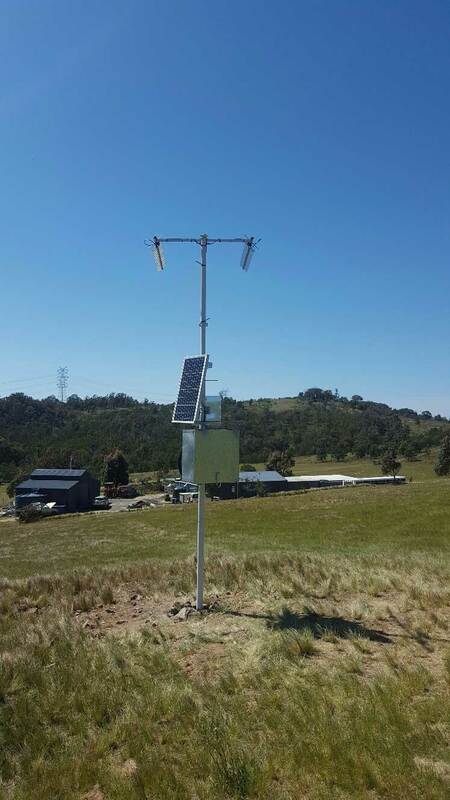 The project by Boztek is making the park safer as it provides 24 hour wind monitoring and alerts.Owing to the amount of otherWiFi interferance the use of the High Gain G Spotters made it possible to successfully bring signal from the 3 weather stations scattered around the park to a central point. Received the "True Blue" Antenna on Wednesday so thanks for the quick shipping. Massive difference on 4G from intermittent signal to full three bars which is awesome – download speeds more than doubled and upload nearly quadrupled on speed test. - CBRE property group do a charity fun run from their city office to Easts rugby club in Bellevue Hill and I usually stream the post run event which is MC’ed by the CEO. - I have done this for the previous 3 years and this year was the first time I used the spotter. 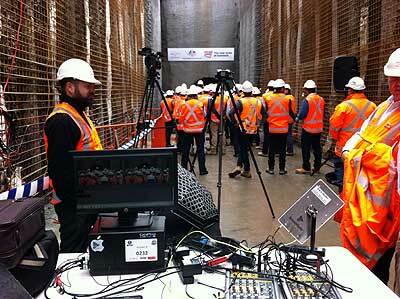 - Streaming to multiple government offices that were involved in the north strathfield rail underpass project. Office workers that could not attend the drilling at the end of the tunnel were able to watch on their computers, tablets and smart phones. - Electricity had to be run from a generator and there was no hard line internet anywhere. - By utilising a cell tower nearby, I ran the G-Spotter and again the stream did not miss a beat. 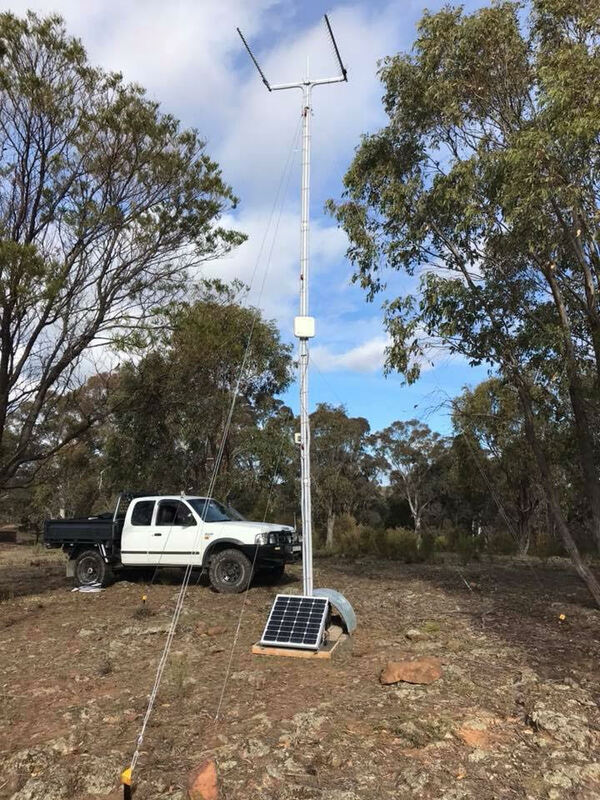 - I had originally planned to run the g-spotter with a 10 metre USB extension cable and mount the spotter on a pole to get it higher as we were in a pit 15 metres below but it was not needed. - NOTE: the setup on the table where my gear was placed looks incredibly messy because there were huge delays in getting into the site due to excess rain so we had to do a rush job. 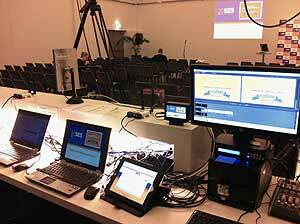 - Wollongong Council had originally booked a wireless bonding system (an ugly device that bonds 4 or more 3G/4G dongles together to create a higher upload/download connection) for the streaming out of their council chambers. Their bonding system kept dropping out so viewers interstate were watching a intermit web stream. They were complaining! - Morning tea came around and I suggested to run with my 4G and g-spotter and they were sceptical because it was only 1 dongle and they thought the upload would be insufficient. - I plugged it all in, I had full bars on my connection and it did not miss a beat, again, for the remainder of the 1.5 hour stream. 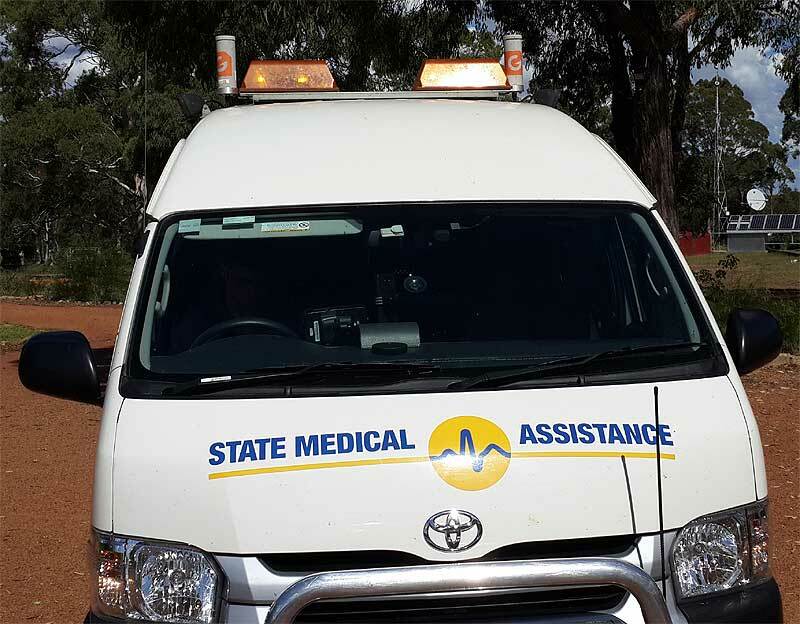 A telehealth service providing Western Downs communities with better access to specialist medical care has celebrated a year of operation in Chinchilla. 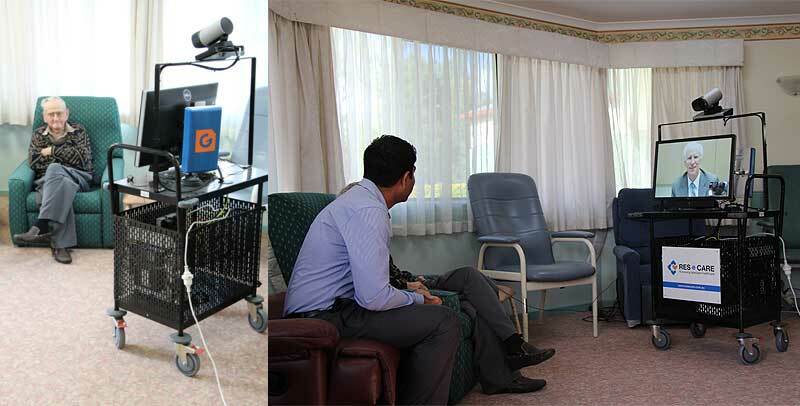 Since September last year hundreds of patients have used the Health-e-Regions service to consult medical practitioners by video rather than travel hundreds of kilometres for specialist appointments in Toowoomba or Brisbane. QGC has invested A$1.3 million in the first two years of the program, which is led by The University of Queensland's Centre for Online Health with support from the Queensland Department of Health and the university's main research commercialisation company, UniQuest Pty Limited. 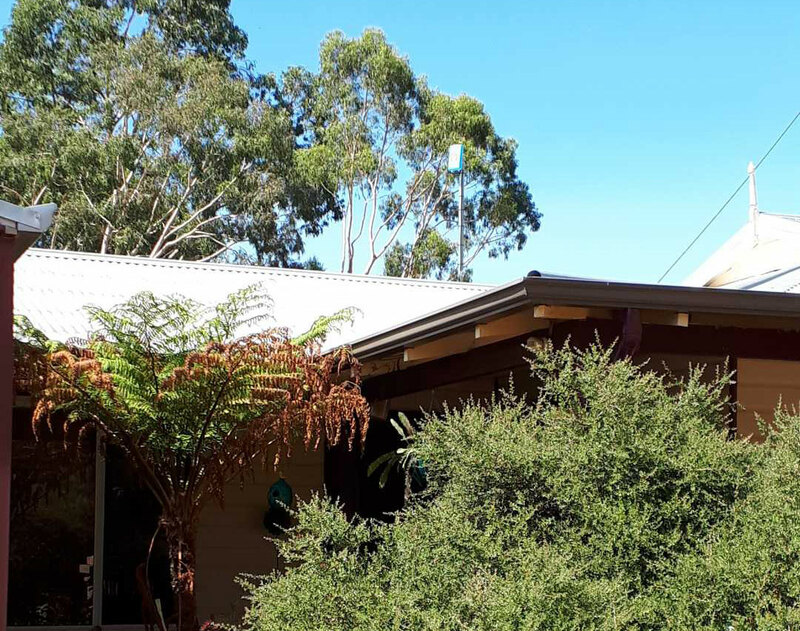 Patients can now visit participating medical centres and aged care facilities at Miles, Dalby and Southern Cross Care Illoura Village in Chinchilla, which celebrated six months' participation this week. In that time 19 Illoura residents have had a total of 25 consultations with a specialist geriatrician in Brisbane without having to leave the retirement village. QGC Vice President Sustainability Brett Smith said community health was a key focus of QGC's work to manage social impacts and maximise benefits of the Queensland Curtis LNG Project. "We've been delighted to see people using this service frequently since it began last year," Mr Smith said. 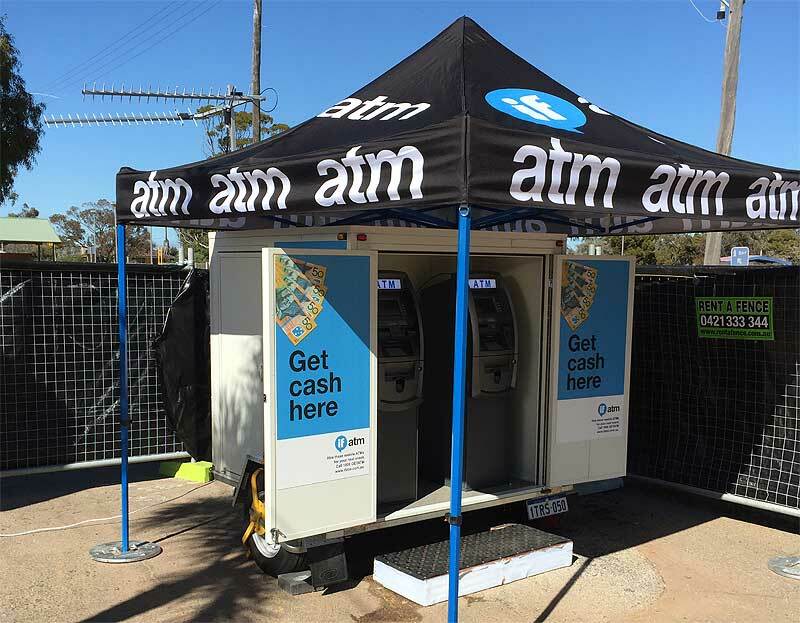 "Now many more will now have the choice of visiting the service in Chinchilla and this is another example of the rising liveability of the region." 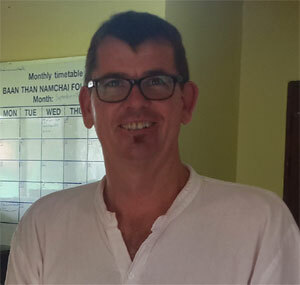 The Centre for Online Health's Deputy Director, Associate Professor Anthony Smith, said telehealth was already benefiting people in the Western Downs. "We've had an overwhelmingly positive response from patients who have already had a telehealth appointment as part of the Health-e-Regions project," Professor Smith said. The towns were selected for the pilot program because they have a high proportion of children, young people and people aged over 65. Just wanted to acknowledge that you did fix my black spot issue. I travel into Murray Bridge every day from Rockleigh & always had 2 x dead spots on my iphone, telstra account even with a 6dB gain whip car antenna. I purchased one of your Omni Squat Car antennas & it seemed to do the trick ! I did like they way you guys were happy for me to trial the antenna & send back (with full refund) if it did not work. But guess what, no need for that ! Thanks again guys. BLACK SPOTS are a real pain especially when in the middle of a phone call. I just want to thankyou for your help with the antennas. I received the antennas last fortnight and are working brilliantly. The g-Spotter is now placed on the antenna pole on the roof of the house (see attached) and the Omni Squat is awesome on the run in the car to town. As we live about 4.6kms from the nearest 4G tower (in Maryborough) the modem went from no service (typical for where we live!) on either 3G/4G to 4-5 bars 3G and 2 bars 4G, with the g-spotter. The Omni also goes well even at home (even inside), went up to 3 bars 3G, and 1 bar 4G. While traveling, it has never dropped out of 4G around town, and goes no lower than 2 bar 3G on phone when on the open road! So Thank you again, and if you could, use this as a testimonial so the ones in the Fraser Coast area can benefit from this. 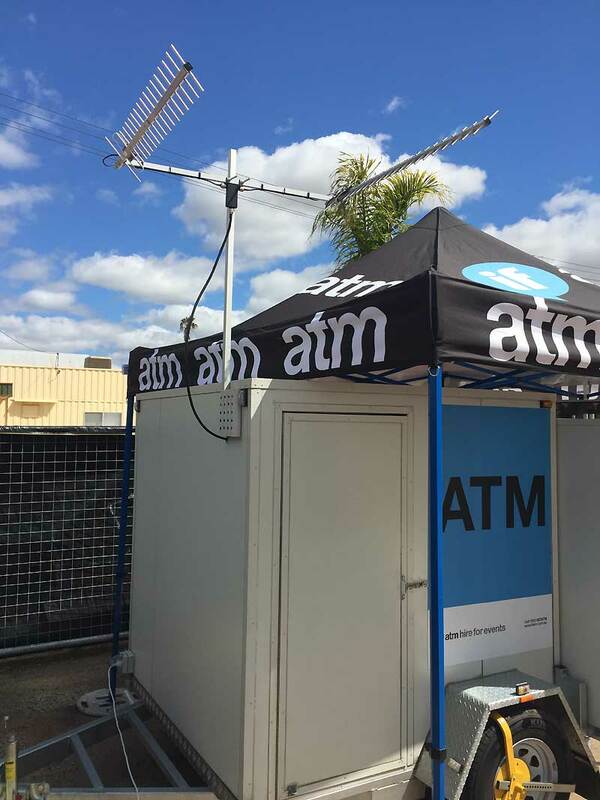 Thanks for opportunity to test the vehicle mobile phone antenna, I used the unit on our recent trip from Sydney to Tamworth, Glen Innes, Yamba and return to Sydney. during the trip I stopped and connected the phone between our current 3db squat antenna and your 5db unit, I found yours gave me a couple of extra bars of reception in remote mountain areas. Just wanted to say thank you for your great product, I bought the True Blue antenna in December and now telstra towers have just been turned on and now we are getting fantastic speeds, we are located in a marginal area surrounded by Los of gum trees. Package received (quickly! ), all set up and working a treat again! Thanks so much! Just a quick word to say that I'm happy with the new True Blue MIMO G Spotter 3G/4G. Works well, I have attached some images of before and after below to give some idea of the actual readings my Telstra WIFI 4g Advanced. As stated to you prior to purchase, my location is 2.9k as the crow flies from the 4G tower and there is a ridge line at the 2k mark blocking line of sight, I now get 4 bars instead of fluctuating one to two bars. Apologies for the late reply. Yes I received the y cable and it worked brilliantly. Connected to the USB modem reception Went from 1-2 bars to 5 bars. This is in Thailand. See the attached screen shots showing reception and download speed. Note the speed did not change much but the stability of the connections the major improvement. I have managed to get hold of a 2nd gspotter from a colleague at work who did not need it any more. I plan to take this one back to Thailand as well for a friend who lives 20km from town. (I lent him my gspotter and he went from sketchy reception to 4-5 bars as well.)" "I want to take this opportunity to thank you for supplying a great product that does exactly what your web site promises! I'm delighted with the performance of the Twin Peak Pro and can't speak highly enough about it - worth every cent! My property doesn't have direct line of sight to a mobile base station. I have a couple of 300 m-high hills between me and the NextG station over 10 kms away. With my Telstra USB modem (MF821) plugged into the laptop I essentially had no signal strength outside the house (occasionally 1 bar now and again on the USB stick for a few seconds). Having just moved into a new house I had some restrictions on the antenna installation. I didn't want to have to drill holes in the house to mount the antenna or feed cables down cavity walls. To avoid this I mounted the antenna on a 4.2 m-high mast concreted into the ground beside my shed where I found I could get 3 to 4 bars signal strength on the USB modem when connected to the antenna. I also didn't want to drill holes in the shed wall to support the antenna mast so I bolted the mast to a galvanised steel channel which I concreted 650 mm into the ground. As added insurance I also fitted 2 x guy wires as a supplementary support (didn't have room for the usual 3 wires 120 degrees apart). Having survived some very strong winds and gusts I am comfortable I could do without the wires. To get the signal to the house I connected the antenna to the TP Link 3G/4G Router you recommended. I mounted this inside a plastic box and fitted a seal to the lid to make it weather-tight. Including the router this cost me around $60.00! Mounted under the gutter of the shed it is "protected" from the weather and has remained dry inside after lots of rain and wind. All in, I only had to drill 6 x small holes in the shed to mount the Router (the antenna cable is held in place by stick-on cable ties that have given no problems). I get a full strength wireless signal throughout the house and have a 100% reliable internet connection. Once again thank you for a great antenna and for all your help and advice. The G spotter Antenna arrived today. Many thanks for the prompt delivery and your email. 4 bars with G Spotter hand held on the ground. I'm wrapped it's awesome. The G Spotter is getting much faster downloads than the 14 dbi Yagi . Both vary from 1 â€“ 3 bars depending on the weather, but as we know it is the actual download speed that is more important than bars. Not once have I been unable to download emails, webpages and even videos at a reasonable speed from my G Spotter. The Yagi also has ultra low loss cable attached whilst the G Spotter has only a supplied low loss cable. This surprised me. But good news for G Spotter. Thanks again, it was just by chance that I came across your website so I will spread the word! After a ton of stuffing around (3 months!!!) 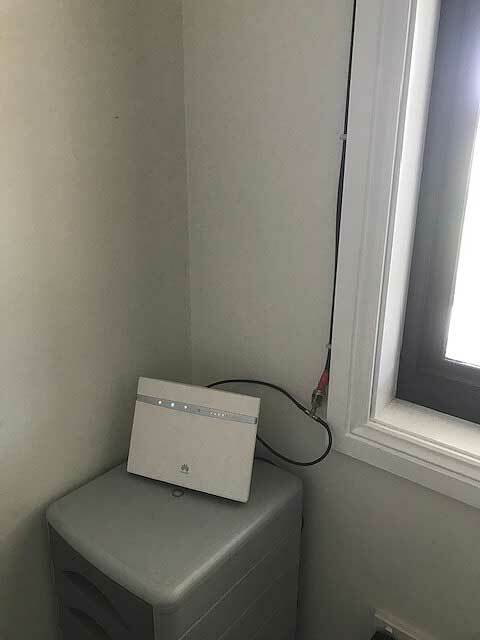 I managed to get Telstra to replace the router as the one we had had a bad antenna connector but otherwise worked okay. Now have the antenna connected and WOW! All I did was go online and find the closest tower (map.spench.net), point the antenna and voila! Brilliant, consistently sits at high signal strength. Only thing I have to do is turn the router off each day. Telstra glitch that reminds me of their â€œstay aliveâ€ issue for so many years. Interesting thing is I am now going to move to Optus as theyâ€™ve released the Huawei B593 on 4G (https://www.optus.com.au/shop/broadband/mobilebroadband/b593/router) and it flies!!! Add an antenna and itâ€™ll be magnificent. So, do you have a patch lead for this baby yet? All has gone well & we are receiving 3-4 bars pretty consistently. 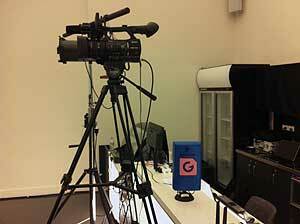 You may be interested to see some photos of our very temporary set up with the Twin Peak Pro. Again, thank you for all your help. When the building is complete & the equipment properly installed, I am sure we will be very happy with a reliable & good communication system. Just wanted to let you know the G Spotter arrived on Wednesday. At the moment I have it temporarily propped in my window and I'm thrilled as I'm now consistently getting 4 out of 5 bars with it just sitting there. That is terrific!! Internet speeds seem to be quicker, but I will do a speed test to compare with earlier ( very poor) results. I use the Bigpond/ (Telstra) 4G mobile usb. 4G is not available in my area, but on the 3G network with the dongle, I can usually get 2-3 bars of reception with the dongle alone which wasn't too bad. The problem was it wasn't consistent and very dependent on which direction I had the dongle pointing. Looking at the signal strength I am currently getting with your G-Spotter, 4 bars even during heavier usage periods, I'd have to conclude that this is going to be a HUGE improvement of things. I'm already very impressed by the improvements made in my internet speeds since (half) installing your G-Spotter antenna. I will attach it outside now that the sun is back out and see if there could be anymore improvements made. Thank you for your help in keeping rural Australians in touch with the world and the little gift was an unexpected surprise! The G spotter I recently purchased hooked up to the new Telstra Smart Antenna now means I can get iPhone coverage without using the cradle I had to use before. Without the G Spotter the smart antenna showed full signal, but did not work well. With the addition of your great antenna, all is working really well, so good having phone & internet without the cradle on the smartphone. Thanks for all your help. PS.. love the free gift I also received...very funny.. will get some good use from that as well. while we build our house. 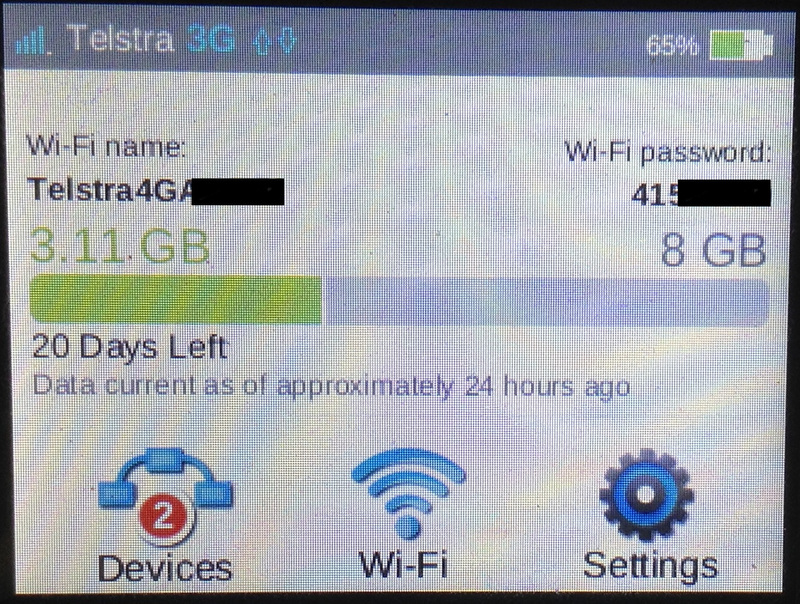 The G Spotter gives us 5 bars on my telstra next g mobile broadband device. G spotter was not of use for me. won't offer any after-sales service when a product doesn't work. Your prompt action and note on Pay Pal is very much appreciated. Hi Dave, We are very happy with the G Spotter. The signal has improved alot. It was very unstable before going from nothing to two bars and on occasion three bars but now the signal hovers between the three and the four bars. A good deal of the time it is on the four bars. Thanks again for your product. 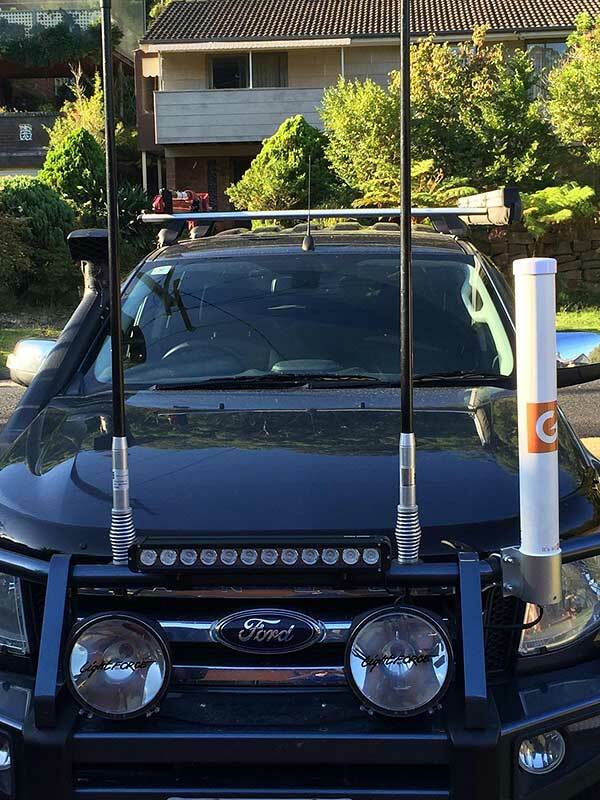 I am writing to let you know that I am very happy with the G-Spotter antenna that I purchased from you. The antenna is a perfect mix between using 4G where it is available and using the 3G network in other areas. I was able to pick up a 4G signal up to 12 km outside the CBD which is quite impressive. My use of the G-Spotter is mainly for uploading files to FTP sites which need to be done as fast as possible. When uploading recently in high signal 4G area I was able to get 800-900 kbps which is quite impressive. I was so happy I purchased one for my parents. They use 3G in a rural area and were getting very patchy internet. The G-Spotter has so far has helped greatly. Anyway thanks your assistance in both purchases as you have made the process so easy. I have just recieved my G spotter antenna. Its fantastic. Could internet reception be so good. 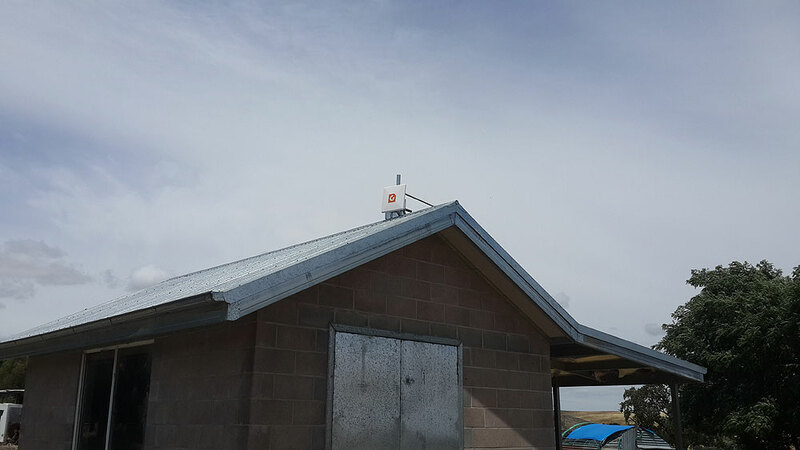 I have mounted it on a pole on my shed roof which I have a omni antenna mounted to as well and I have pointed it towards my nearest Telstra tower at Boyanup WA 6237. 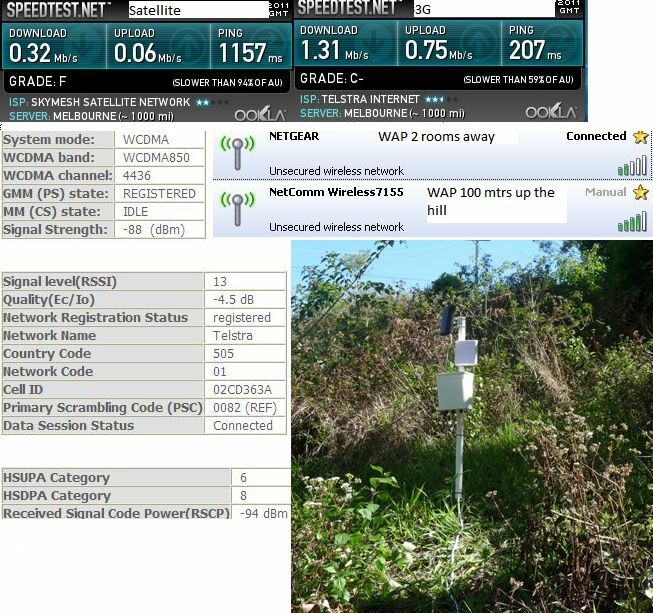 My tower is about 7km away in a straight line and in the way is a slight hill and a forest, I live in Crooked Brook WA 6236.I have the y branch patch cable plugged into my 320U Telstra 4G USB modem which in turn is plugged into my Netcomm 3G/4G Wireless N150 Router. I now get 5 bars signal on my 3G network up from 3 to 4 average with my omni and I am also getting 3 bars on my LTE/4G network up from 1. I have locked my modem to the 4G network rather than have it switch between the two. My speed has doubled from around 1.3Mbps to 2.5Mbps, which I am rapt about. 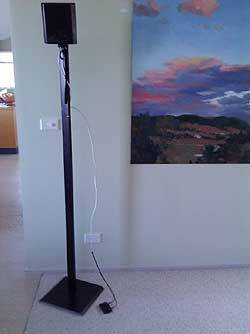 The G Spotter arrived today and antenna is all setup – signal strength has increased from 1 bar to 3 /mostly 4 bars. Probably need to fine tune the direction a little bit. Many thanks for the prompt service and a successful outcome. Hi David, I received The G spotter on Friday, Thank You. It's doing a great job. Initially I tried it inside receiving through 400mm masonry walls and obtained 4 bars. 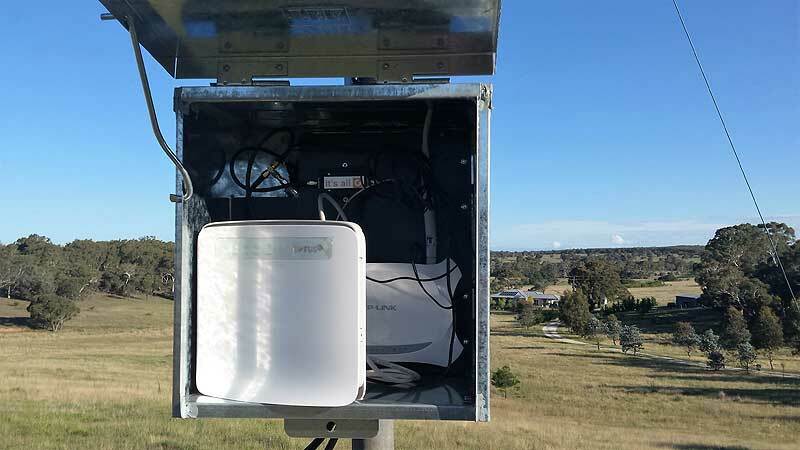 Telstra 4G modem at GLENBROOK NSW. fast internet at last. thanks for all your great advice. Hi Dave, just thought you'd like to see what I did with the G-spotter. I mounted it on a shop display stand so I can move it around. It works really well with the new 3G/4G modem/router Telstra gave me. I only get 2 bars without The G-spotter & 5 with. Thanks for your great antenna. and for first time watched iView in this house ! 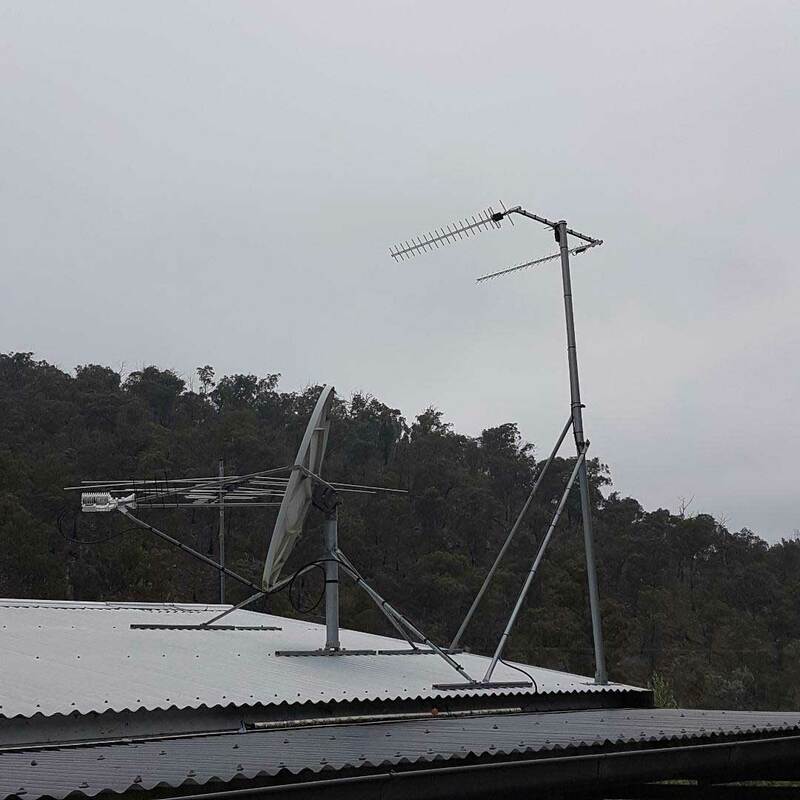 We live in a remote area behind Kilkivan called the Black snake,we have tried all types of aerials none have worked ,i have just installed the Twin Peak," wow' !!! great service on the internet ,mobile phone ,even in bad weather . I work over seas and Skype is the only way to stay in contact with my family ,also my son is home schooled thanks again dave this Aerial has solved a big problem for us, for any one who is thinking about buying an Aerial "this man knows what he is talking about". 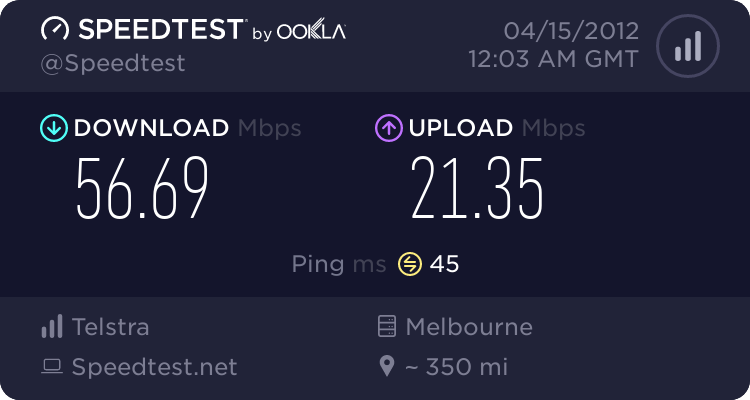 My True Blue G Spotter is working great some 4 months now with 4G LTE , I recently uploaded 750mb to my clients FTP server in Melbourne, it took 10min 32secs, it was a Video clip 22mins long in standard definition, with 48khz stereo audio. amazing that we can send vision clips in "Twice realtime" for little cost and from many locations across Australia. Well done to you and the True Blue GSpotter. oh ! and the birds don't like sitting on it like they do the TV and Yagi antenna's. I’m wanted to improve the reception to my Sierra Airless 320U modem (For the new Telstra 4G Network), which I use indoors and run through a Netcomm 3GM2WN modem to create a home wifi network. Outdoors I can get a ½ decent signal strength but indoors is poor. I live in Kingscliff NSW 2487. I have installed your product and it is working great. I’ve gone from 2 bars reception to 4-5.... awesome!!! ..... if i do not post a speedtest, then how can you get / give any simple indication of what signal i'm receiving/sending?. By posting the signal strength in RSRP and RSRQ. Its easy information to find out that the Telstra and Sierra broadband managers tell you. If you post these results with and without the antenna that is some actual proof as to what improvements this antenna provides. As previously mentioned the speeds are entirely irrelevant without some signal stats to back it up. Because speed is dependant on a plethora of other factors. Also you giving speeds for a US server is dependant on an entire range of other factors such as International Backhaul. Also the thing I dislike about the web site selling these antenna's is a lack of factual data sheets. Its all marketing with little facts to back it up. It was easy to get the "RSRP and RSRQ" figures via the watcher when I had the 320U plugged direct into a USB port, but I now use the davado router mounted high on my office wall to keep cable run short as possible. Can you advise where in davodo log-in page are those figures ? But Anyway ethoscraig, Being an easy sunday I connected my Mac laptop on my ladder up next to the 320U modem , with no router connected, and tested for you. RSRP -86dbm and RSRQ -5db. attached via 6metres of cable to True Blue antenna about 8metres off ground level, 9.6km from LTE tower, 3bars of signal in Sierra Mac 1347 watcher. 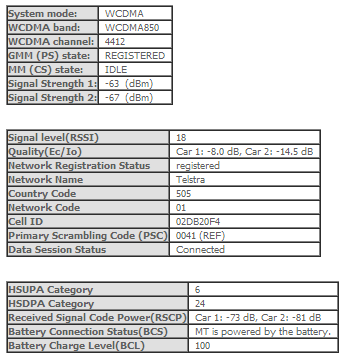 RSRP -122dbm and RSRQ -10db, 1bars of signal with no antenna cables connected to modem. I'm sure all technophobes will make sense of these figures. Yesterday I up-loaded to a melb based FTP client about 620mb, took just over 7mins, that to me is a real world usage, comparing that to the near dial up speeds of most 3G towers I'm amazed their is not a revolt out their for a better service from 3G. Personally, I like many others look for "real world" feedback on places like this forum and others before making big purchasing decisions on products for specific purposes. Techno sales speak leaves me cold and limp most times, many web sales sites out their have mountains of specs etc, but with little feedback from users right across Australia as his does. You can bag out the "True Blue" G Spotter guy till the cows come home, but if his product/s work, who cares, seems only a few take offense at his products success, (must be due in part to the Ozzie tall poppy syndrome we all know and love). and as he states, if it don't work for you, send it back, how many other antenna suppliers will do that. and Yes, I'd have liked to have paid less, but that is the price, and you either pay it or build and test your own as the yagi thread shows quite well. FYI, My "irrelevant" speed just now this lazy slow sunday morning. I had really bad mobile phone signal problems in my office at justboards.com.au in the Brisbane suburb of Geebung. Only just marginal with Telstra, Optus & Voda. Now, not only greatly improved signal inside my office, an easy disconnect means the magnetic antennaclamps on car roof when I travel. 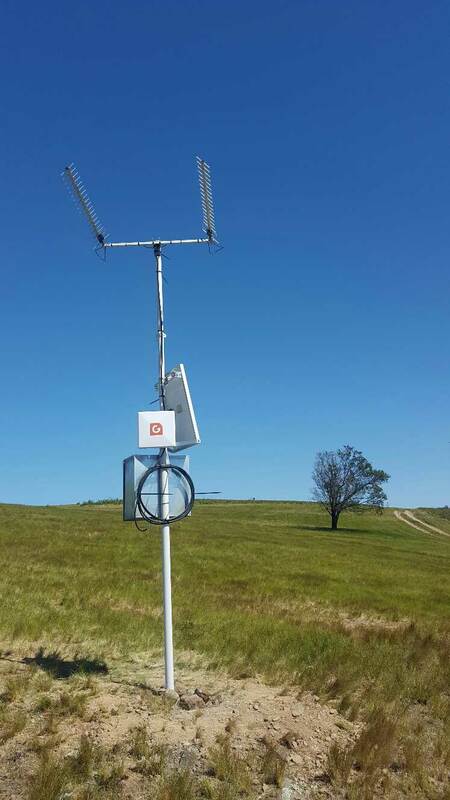 Thanks for a great product, works very well even if the base station is behind a hill! gave me the extra db\'s i needed straight away.Unit has weathered well over 3 months and is so easy to mount anywhere. excellent quality as well! To sum up worth the money and customer service is next to none!!! You are a marvel for creating such a wonderful antenna, can now get internet with the G-Spotter on a chair outside the door or on a chair inside the door. It is terrific, can now get online without any problem and I do not even have the box mounted yet. Thank you so much for a great product. Prompt service. Telstra could learn from what is "claimed and delivered ". I used a telstra next G - elite wifi ( small oval shaped item. Normally 1 to 2 bars. Connected G Spot antenna walked around outside on veranda , signal shot up to 4 bars. 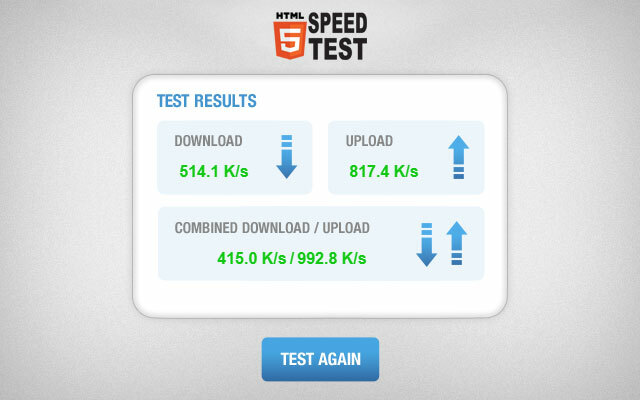 I have my iphone 4 with Speedtest.net for checking speed. Normaly 1 to 2 bars gives a speed of 0.34 ~0.5 Mbps. Now with G - Spot , i was getting 1.4 Mbps . The boys wanted Dr Who episode from I tunes. normally takes hours to down load. Now 55 minutes. 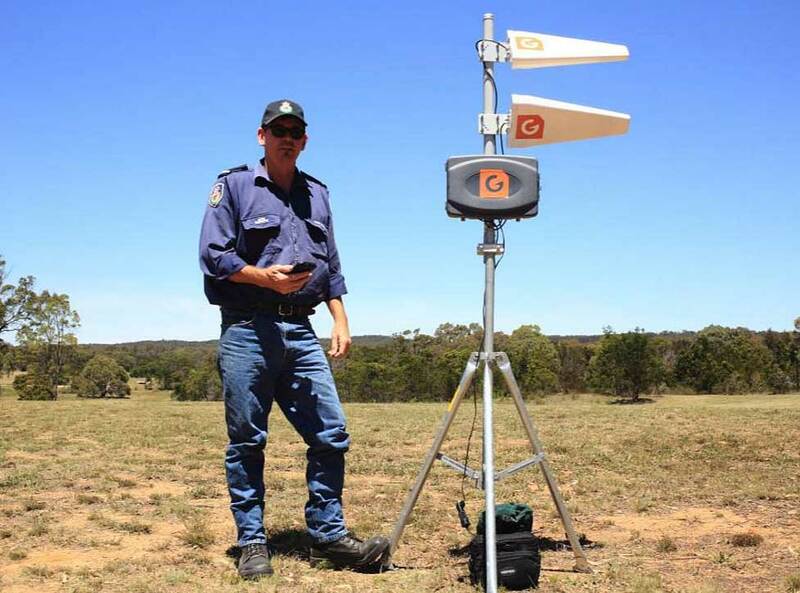 I have just purchased a Black Panel G-Spotter Antenna as I was having difficulties with Telstra's Wireless Broadband Connection here in Batchelor NT. Thanks Dave for a great product, well worth the small investment. 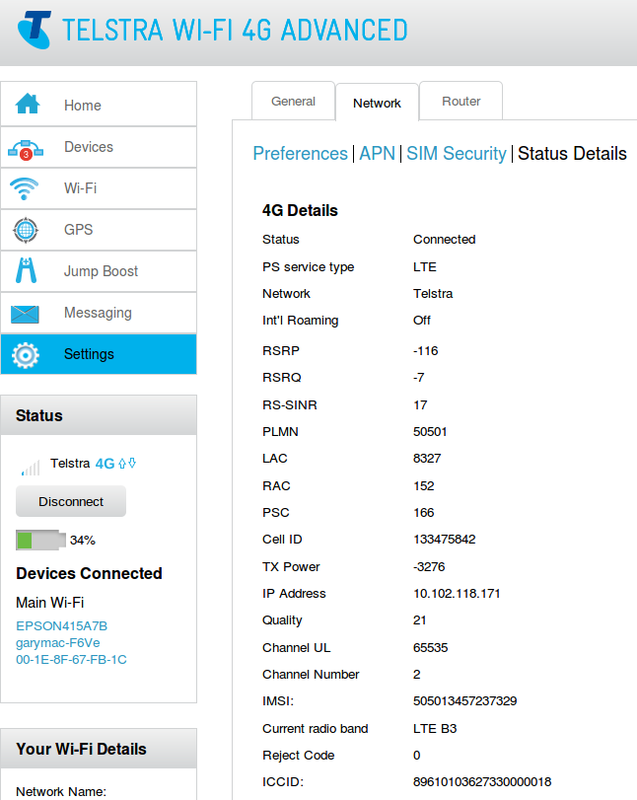 --> POSTED ON WHIRLPOOL FEBUARY 2012 SOON AFTER THE LAUNCH OF THE G SPOTTER "TRUE BLUE" 4G MiMo ANTENNA. signal Now 87% in Davado page, since shortening both antenna cables to 5Metre lengths. What exactly is a MIMO antenna? 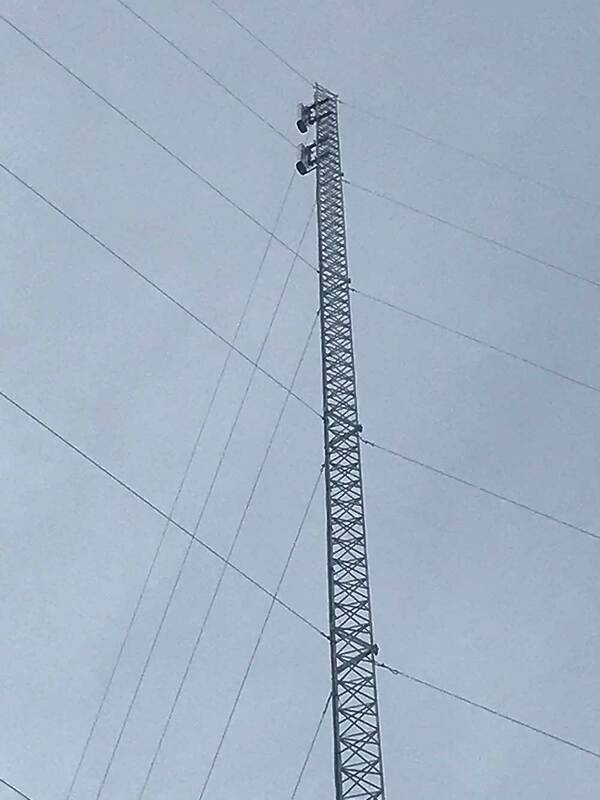 Why couldn't you use two normal 1800MHz antennas? I was under the impression the leg work in MIMO was done by the signal processing hardware – some sort of clever mapping and modulation and nothing to do with the antenna its self. MIMO is all about spatial Rx diversity, effectively creating (with very smart receiver processing) two independent channels of data on a single frequency band, ergo double the effective bandwidth; while still conforming to Shannons law. Two antennas is what you need. The True blue is exactly that in a little blue box. Each antenna is good for 12dB; so it is quite a powerful package. I just received my G-Spotter. Without even trying to optimise the positioning of the antennae it has doubled my upload/download speed and cut my ping times by two thirds (all tested on speedtest.net). Money well spent, thanks for the prompt and friendly service. Thanks for the package, .I now have five bars on 3G which was impossible before, I am the only one in Kybong QLD on Optus who gets this reception. I think!!! Please use this as a testimonial because it might help some one else in my area. Once again thanks also for the phone calls because just lately some tradesmen cannot be bothered to reply let alone chase a call up when it fails to be answered. The G Spotter arrived today. I set up inside first and had improved performance then moved to outside and better again. 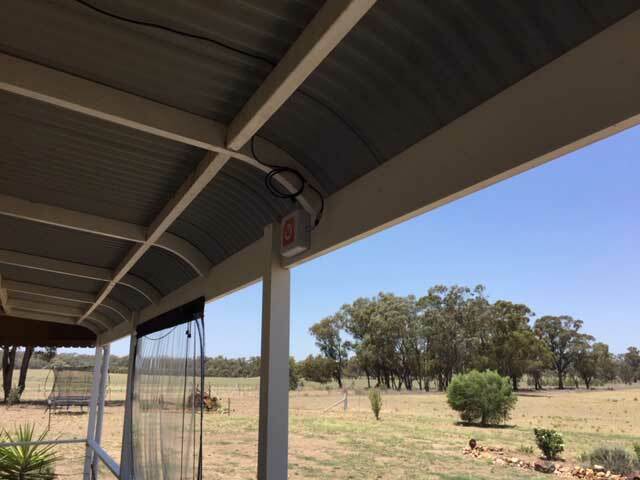 Have mounted on the verandah facia board and getting 5 bars. Thanks again for all of your assistance with this order. Just wanted to say thank you for your G Spotter product. I now get speeds of over 30 Mbps. Maaate, i'm just a wee bit green when it comes to computers & electronics, but I do know that my reception/speed has improved enormously. That in itself is helping with learning how to use these things and easing frustrations that often comes with slow speeds. We have a 3G21WB Gateway which we use at home and also when travelling in our motorhome. 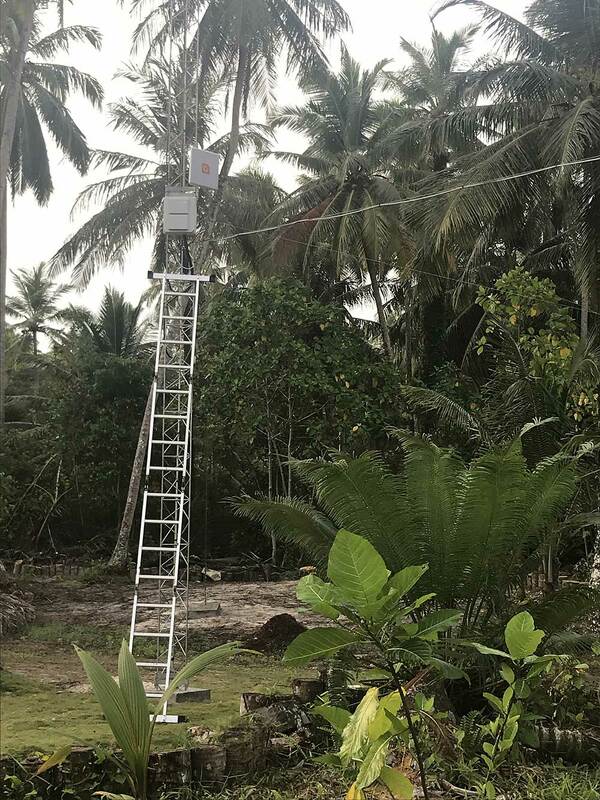 Even though we live only about 4 Km from a mobile tower, at home our Gateway signal strength was 2-3 bars and the wireless connectivity was pretty unstable, sometimes even weather affected, causing considerable frustration. The Gateway worked pretty well while travelling provided we had a mobile signal of at least 3 bars. Telstra/BigPond, though willing enough, were not able to solve our problems either by phone or online – largely due to the massive amount of information on their website and us amateurs trying to navigate We started researching external antennas and, fortunately, stumbled across the G Spotter – recommended on a forum.We contacted Dave, who responded promptly with sound advice both on the phone and by email. We now have the The G Spotter Omni Squat Antenna in all it’s day-glo glory attached to the Gateway and we have done all the firmware and software updates that Dave so helpfully suggested to us, even providing the links, and ............ we now have 5 bars at home! 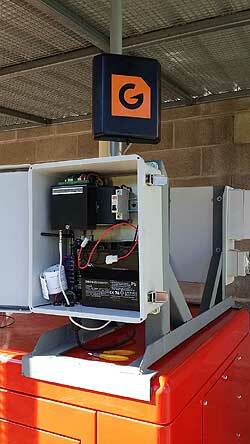 Our G Spotter will also be a serious improvement on our mobile phone reception while we are on the road. And our frustration has gone. Thank you, Dave, you are a joy to deal with, especially when it is just so hard to find someone who really knows what they are talking about ..... not to mention who actually also cares! 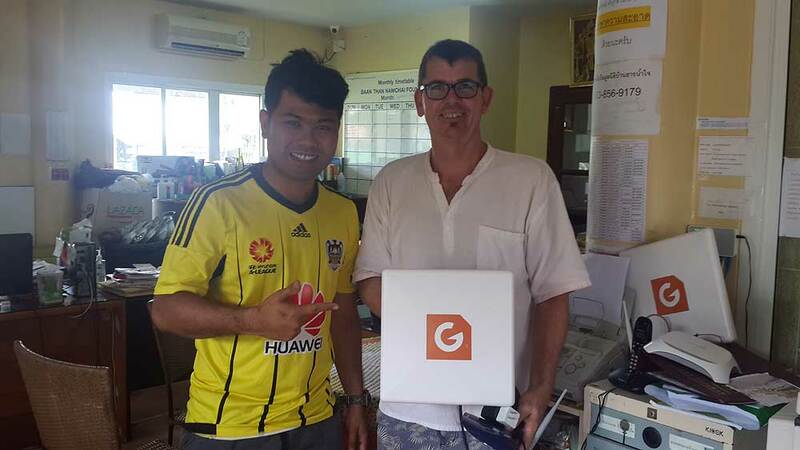 Thankyou so much David for the G Spotter antenna I have purchased! I live in a total wireless dead spot in Banksia Grove, WA and thanks to this little unit, i now have internet! I dont do many testimonials , but this G Spotter worked “ Just as Dave said it would” . It took me about 3 hrs to self install , but that was because i had to find my way through a stone wall. The actual install of the G Spotter onto the pole only took about 30 minutes, and was as simple as you get. 5 bars – i have never had that strength of signal here where i live in Rural Victoria , just outside Mansfield !! I was happy!! You will note i have included my Skype address, i am a ‘Real” satisfied customer. This thing really did improve my signal strength. And thanks Dave for the great advice and prompt delivery. Just wanted to say “Thanks” for all your help getting us on line. We are still going great, signal strength is between 80 - 89%, Link Quality is steady at 96% and Data Rate is 48-54Mbps. We thought we would write a bit of a blurb about our saga so others can see there is a solution to their internet signal problems, you just need to ask the right people. We were on satellite for years but when I took on a contract to work over the internet we needed faster download and more of them so we asked Telstra about wireless and were signed up to Bigpond wireless. When we first got our Telstra USB Modem in July this year we had absolutely no signal so couldn’t get connected at all. Then we lucked on your G Spotter, called and talked to you for a while and ordered one, mainly because you offered a money back guarantee if it didn’t work. And as soon as it arrived and we plugged it in we had 2 bars of signal, we couldn’t believe it. The speed wasn’t lightning fast but it was so much better than what we were getting with our satellite and it was constant and steady. Then 4 months later, bang, nothing, signal gone completely. After 2 weeks of having new modems sent and going through Telstra’s Tech Support (what an oxymoron that is), Telstra’s only explanation was “something must have grown up between you and the tower”. 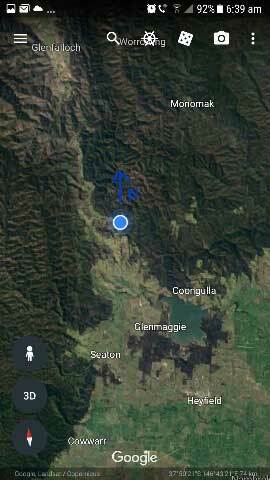 We were then referred to Telstra’s Premium Plus Support, who charge a fortune, and they finally told us we had been lucky to ever get any signal in the first place as according to their maps we were way out of the signal zone. It is so frustrating when they keep telling you different things without anyone wanting to help with any decent advice. Then, of course, it was back on the phone to you. On your advice we went out and bought an Elite Home Gateway wireless router from a Telstra shop, the cost of which Telstra has agreed to cover, and we ordered your Wifi Extender with internal antenna. Once these arrived and were set up we wandered around the block looking for the best signal spot, and it was up near the shed about 50mts from the office and PC. Then it was back onto Telstra for 6 hours to try and sort out the SIM card and router settings to absolutely no avail. No signal still and the settings were correct according to them but also according to Telstra there was no need to set the router to an external antenna as it was done automatically by the router’s software. Then, of course, it was back on the phone to you asking what next. Sorry about that, it must have been like talking to 2yrs olds for you. Luckily our teenager was home and could talk to you about what was needed next, which was a big ask considering you flying blind trying to figure out our set up over the phone. But we needed more help than we thought, namely a laptop. As luck would have it we again stumbled on someone who was genuine. Once we had told him the problem and the solution we wanted he set about fixing things. Using his laptop we found a spot in the house where it could pick up the wireless router OK so we shifted our PC to that spot and it could pick up but wouldn’t download. Back out to the router near the shed and following your instructions the firmware was downloaded and at last a box appeared that asked to choose between an internal or external antenna. At first the IT bloke was very, very reluctant to believe the external antenna would have much effect on things but, boy, did he change his mind once he hit that button and the G Spotter took over. We went from no signal in the office to 4 bars, with the router up near the shed, 50mts away. So now apart from hubby wanting to shift the router to a dust-free room, we have wireless broadband with constant strength and signal. And a local IT bloke who is telling all his customers about the G Spotter and Wifi extender. And your G Spotter and Wifi extender are brilliant and do the job you said they would. We will certainly be recommending them to anyone we know in the same boat. I don’t know if we ever told you but the irony of all this is we only live 30mins from the Brisbane CBD so we’re not remote by any stretch. Thanks again, Dave. Without your advice, help and patience we would not have any internet. I finally rigged up the antenna and I can now discontinue my satellite internet connection!!! Thanks again, It is a pleasure to work with someone who genuinely is looking for the best result for the client rather than just being in it for the bucks!! 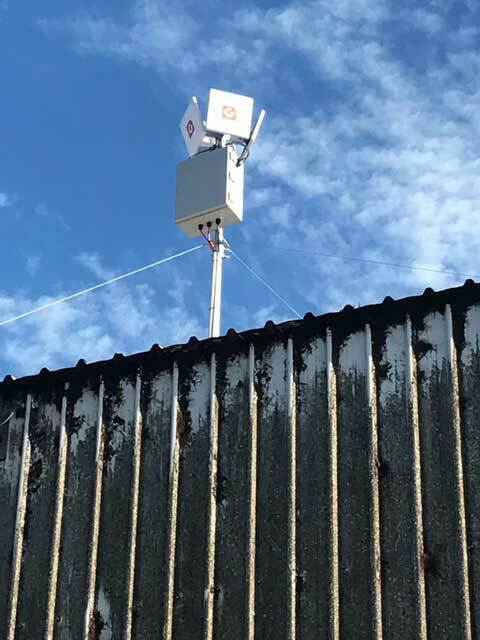 NB.Andrew purchased a G Spotter Antenna and one of our new white panel directional WiFi antennas and set up an access point 100 mtrs from his house, where the next g signal was stronger, he then transmits the signal down from his router in WiFi. The below picture he sent me showing his results. Briliant got the G Spotter and I can't believe how fast our connection is.Took me less than an hour and i am no techno. Told a friend today about the G Spotter who also has trouble getting reception. On behalf of my wife and I...brilliant yet simple. Just wanted u to know the g-spotter has improved our broadband by 100% we r so very happy with it we will be letting our family and friends know all about g-spotter and how very friendly you are and so very helpful thank u so much. Dear Dave - here is a photo of 15-year old Putu who lives in remote west Bali. Her parents had saved to buy her a laptop and USB modem to help her at high school but she could get no signal at home although a couple of km up the road there was enough signal. 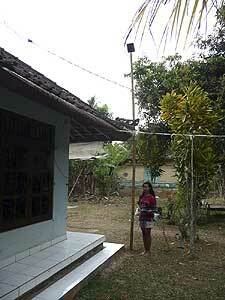 We took the G-spotter over and her father set it up on a bamboo pole. We had to use the velcro on universal connector as the modem had no socket. She now gets 3 bars of signal which gives her internet access.The local phone network is Edge, not 3G. 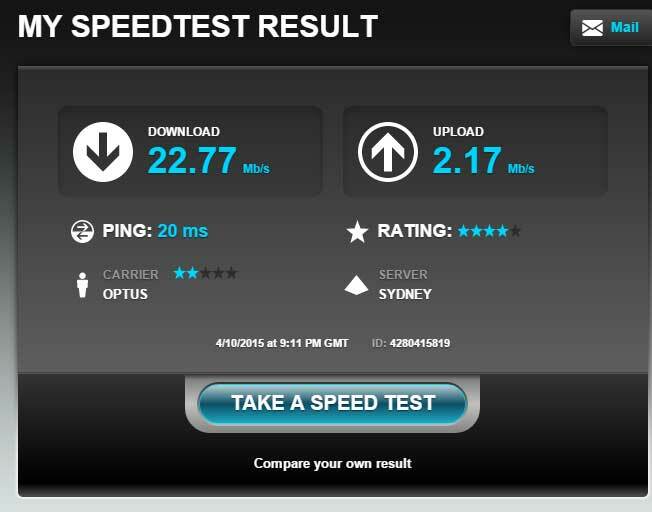 It is not fast by Australian standards but I checked it and it is not bad and certainly better than no signal at all ! I work across Australia, inner city, outer suburbs and way out in the sticks. My business is live streaming over the net. If I can't get a secure connection with good bandwidth, then I have no business. Only through frustration, stress and desperation lead me on a frantic search to find anything that was going to help me with the inadequate reception/connection for my line of work. Then, I came across the G spotter antenna, that sounded amazing in theory. But still had sceptickle on all the claims. I decided to bite the bullet, as I had no other option, when I to deliver on what I promised I could do for my clients. Results were more than amazing!! In some parts, I was lucky to have one bar of service. The g spot smashed this up to four, even five! I can not thank them enough with all their help, specially at a customer care level in their concerns in helping me reach my bandwidth goals, in taken the time over the phone in making sure their product was right for me and would achieve everything they claim the G spot antenna would do. 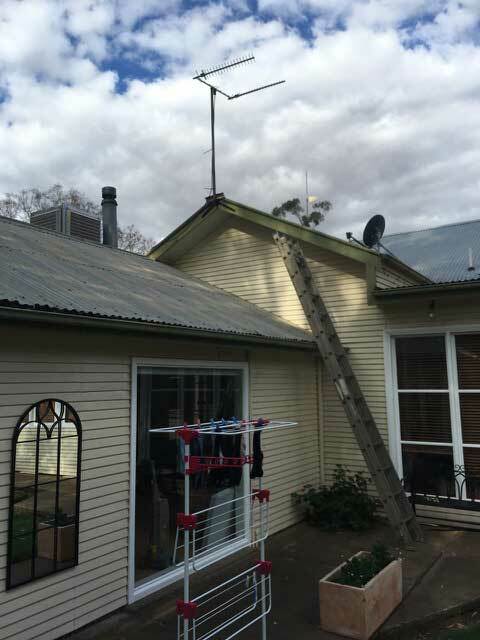 Having moved to the outer Adelaide Hills recently we have been challenged with a variety of reception problems in our new place that being TV, phone, and the satellite broadband gizmo on the roof,setup for our computer. If it wasn't for the rolling hills and beautiful scenery around Bull Creek we may have regreted our decision to move in some respects, not that all these luxuries are the most important things in life, but you do want them to work when you need them, particularly when you have teenagers at you asking Why is the computer so slow? The satellite dish looks impressive on the roof but thats as far as it goes if you want dial up speed and pay ridiculous amounts of cash to do so. Our other problem is that we are surrounded very closely by hills so i thought we will never be able to have proper broadband again. Some searching on the web for alternatives lead me to Daves website and his product called the G Spotter. Having read the reviews i thought i would give it a go, but doubted it would work for me. The good thing also is that you can return it if it doesn't work and if you have any queries on the techno side you get to talk to a real person who obviously is passionate about his work and has all the time in the world to help you. 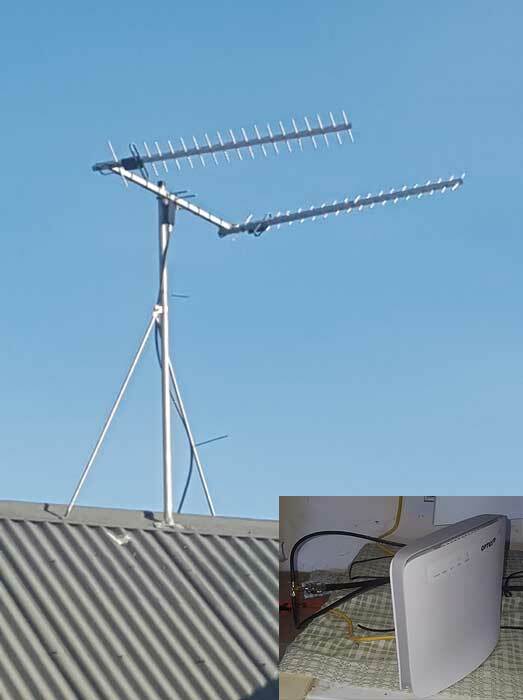 When the unit arrived we tested it with our neighbours dongle and on my wifes labtop.We went ouside and i climbed on the roof and straight away four bars of reception and a speed similar to what we had in the city. It was nice to be pulled out of the dark ages by this antenna and even if you don't think it will work give it a go because it very likely will. We are a proud Sponsor of "Wings For Life" Raising money for the Royal Flying Doctor Service. 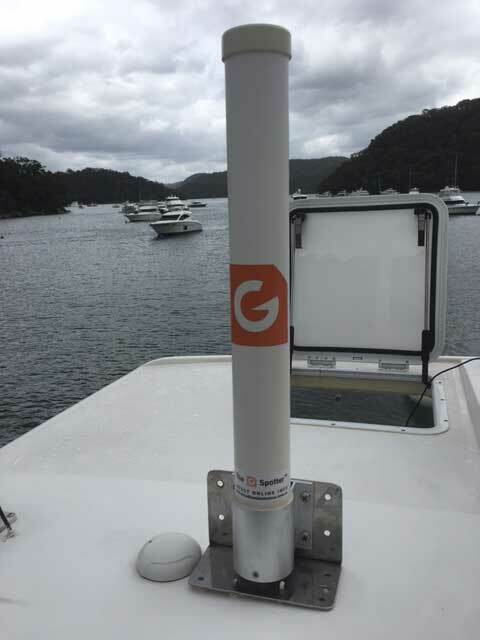 Our new G Spotter Antennas are being used during the month long Australia wide flight to access internet & phone in remote locations. Just wanted to say thank you for all your help. I installed the G Spot over the weekend and the change is enormous to my speed. 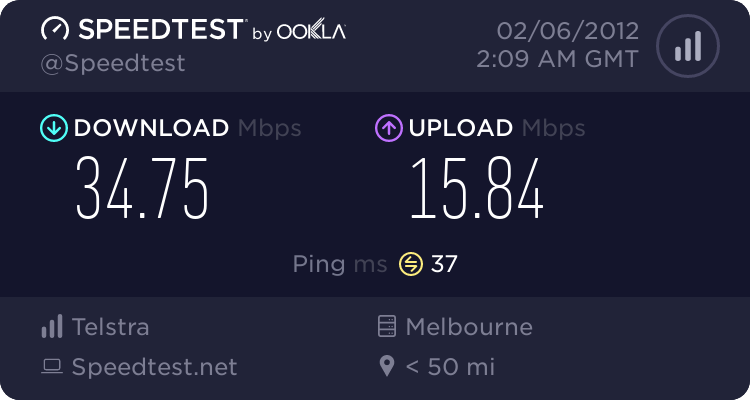 I hope everyone who is using Optus Wireless in the city (Footscray) and is not happy with their speed to invest in this. Don\'t wait for the NBN, invest in this. Great work with this devise Dave and all the best for its future. I would like to thank you for your advice on getting a better signal on our 21 Elite Gateway Modem. You were so obliging and patient and it was so good to speak to someone who really knows what he is talking about. You are a lifesaver, your advice and expert information, has made the difference between no internet and some super fast (better than ADSL) internet access. 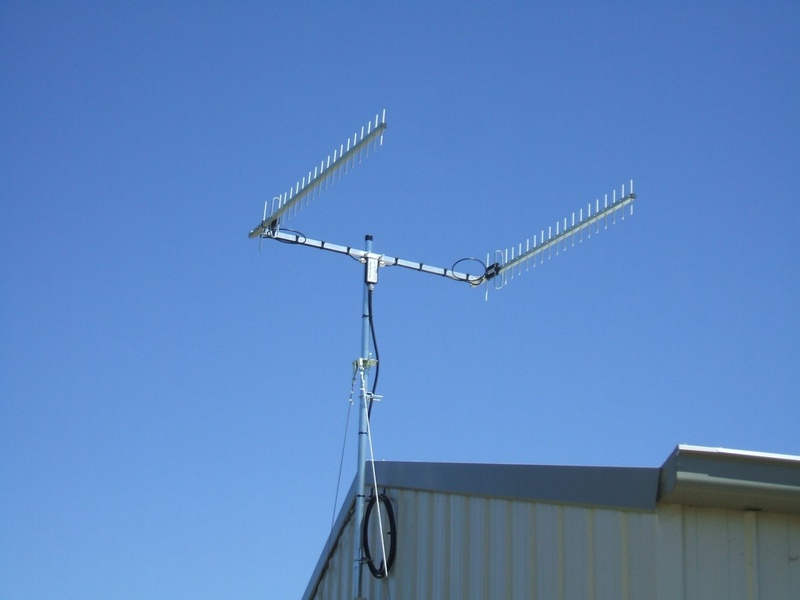 Your G Spotter Antenna is great and the whole family can now do what they want on their own iPhones and laptops. 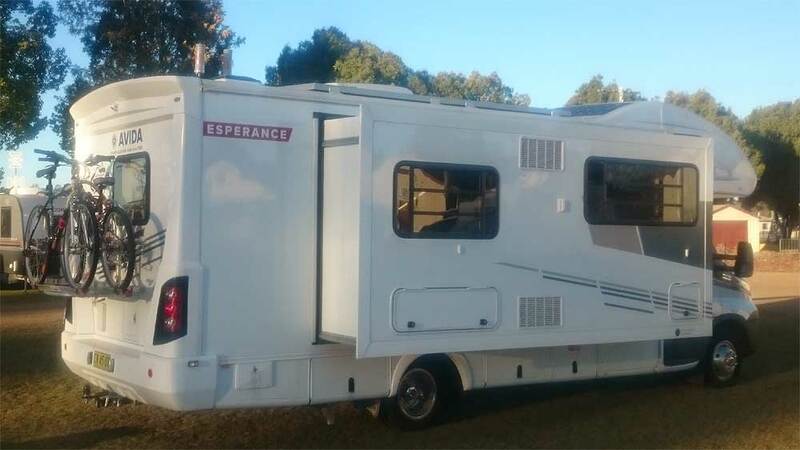 I will reccomend your product to anyone in a dodgy reception area (you should get a job with Telstra as you are the only one I have spoken to that is willing to help out) thanks again from the Jackson Family. I spoke to you about 3 months ago re the "The G Spotter" antenna. I have followed your advice and mounted it outdoors and just wanted to provide a bit of feedback. Firstly I should mention that the ISP I am with uses the Optus 3G network. When I first contacted Optus they told me that their 3G service would not work at all at my location and therefore would not be guaranteed. I took the chance anyway and purchased the modem. It worked OK most of the time but often only at dial -up speed (or slightly better) and was subject to complete drop-outs. It was an improvement on dial - up but not really reliable and very variable. I tried a couple of "high - gain" omnidirectional antennae and found that they made little or no difference - fortunately I was able to return them to the retailer as they were of no real use to me at this location. The G Spotter has made a big difference and now the signal virtually never drops out and is at broadband speed most of the time. Of course it depends on prevailing weather conditions (that seems to be the nature of wireless internet) but the service is now 99% reliable and generally pretty quick - at times up to 2 Mbps. It does still vary but is always much better than the old dial - up. I also noticed when installing the antenna that it does have a fairly wide coverage pattern ie it does not need to be directed "spot on" towards the tower in order for it to work, although it probably is worth spending some time (as I did) to find the best angle. Overall I am very happy with the performance of your antenna. ADSL2 is not available in my area. A neighbour has ADSL1 but says it is pretty slow. Your directional antenna has allowed me to access broadband at reasonable cost. It is sitting behind my TV facing the wall. Rcvd Gspotter today (Thursday 13th Jan) set up OK using 900mhz connection on the modem and I am very impressed. Now I can use utube without waiting an endlessly long time or giving up. I will need to watch my usage now! (The G Spotter Antenna...) is the only thing that works for me here with my iPhone which otherwise gets no bars inside. Simply resting the iPhone (3GS or 4) on the top of this antenna gives me 3 bars, and I use the cable from the antenna to feed a modem. It's not quite as good as a directional yagi, but for ease of set up and it's versatility, I'm glad I bought it. You may be able to purchase it with the option of returning it if it wasn't successful. The chap was comfortable doing this for me if I wasn't happy with it. Hi Dave the system I purchased from you (G-Spotter areial - router and wfi directional areial) works fantastic. 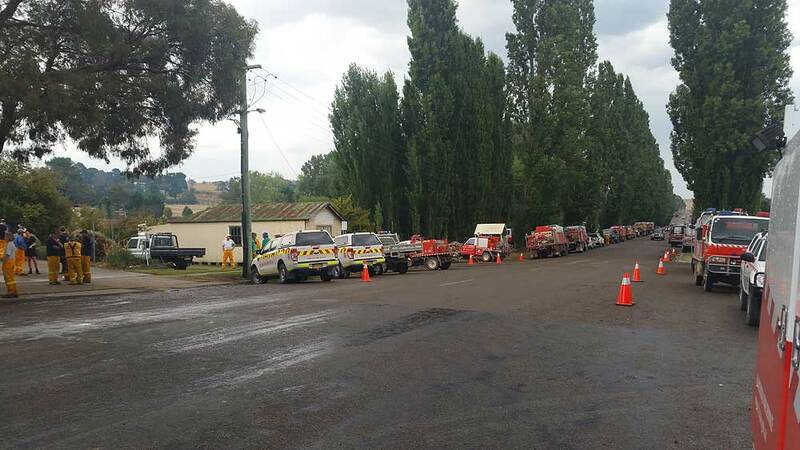 I took this set up of yours as you know to my brothers place at Upper Bingara (nth wst N.S.W.) we had a lot of trouble locating a signal we found a signal that had 1 to 3 bars fluctuating some time no signal this signal was right next to the corrigated tin shearing shed. 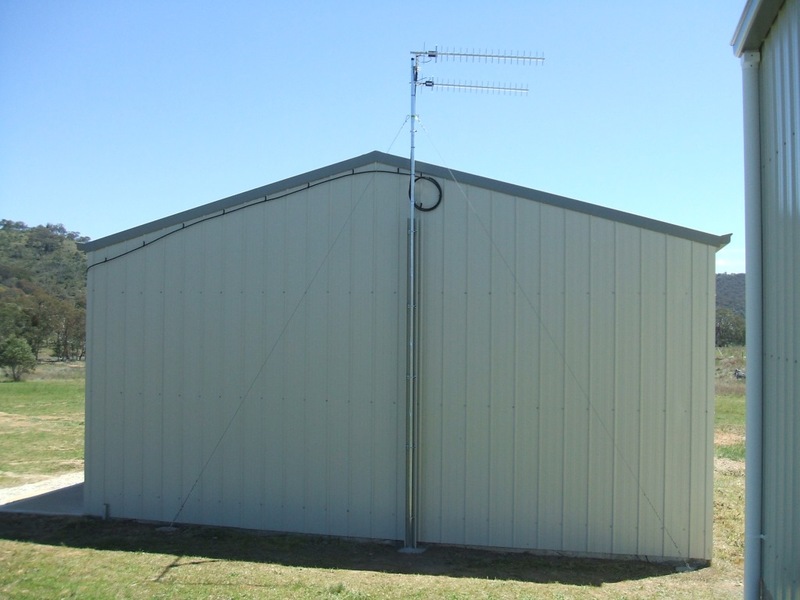 We knew we had to stay within the 300M range of the house so I made up a 10Mx30mm water pipe attached your G-Spotter WFI gear and stood this assembly up against this shed with your G-Spotter 3.5Mtrs above the roof. We now can maintain between 2 to 5 bars. reception on a laptop in the house 300Mtrs away is great home computer had trouble with the Belcan USB divice pushed into front only one bar but we put it on a short USB cable placed it on top of home computers steel top which created a flat reception plane and BINGO it could do what the laptop was doing 2 to 5 bars which enabled internet Ebay access. So Dave on behalf of my brother and myself thank you very much for a wonderfull device for people that live on the edge of technology that can't use it. PS Telstra people don't understand there own devices (DATA CARD system) we found 1 person out of 7 phone calls (3 hours worth of time)one who new a little about it and sold us the CARD system that lady was in Inverell Telstra shop a 150km's away. Thanks again Dave. 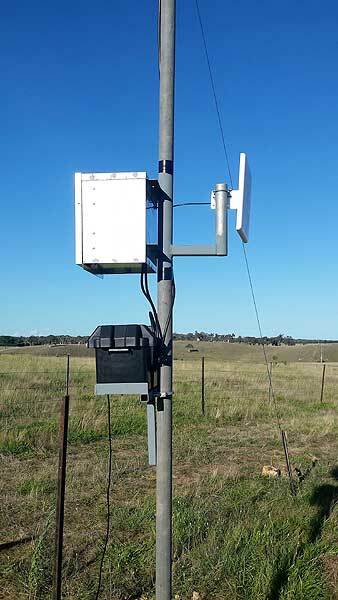 As discussed I couldn\'t get any coverage in Chugga Lane Windellama NSW 2580, until I installed your antenna and faced it north towards Marulan. Now its all good two bars and on the net using Telstra and optus.I have preferred to stay with Optus and have now installed a DIR451 DLINK 3G modem/wireless router and have wireless connection all round the living area of the property. Thanks once again. As suggested by you, armed with my new antenna and 3G Telstra Country phone, I walked around the yard as far as my 10 metre cable would extend in order to use the computer. I could only pick up the 3G signal - no bars, however in walking down to the shed 10 metres away I had 4 bars, astounding! Well I didn't give up, I got the antenna attached it to my telstra turbo usb modem and computer and walked around the yard again, I have two permanent bars in a direct line facing three large trees and several mountains, couldn\'t believe it! I am so happy my internet speed is awesome, much much faster than satellite, and it has even worked in storms where the satellite hasn't. Great Product - you genius! Hi Dave, The G-Spotter you sent, does the trick in a reception "black hole", which is my house. I have installed the antenna on top of my computer and point it towards the direction of town. Well done. It is a very good product. Far out, how good is it! I connected it and straight away it gave me full reception. 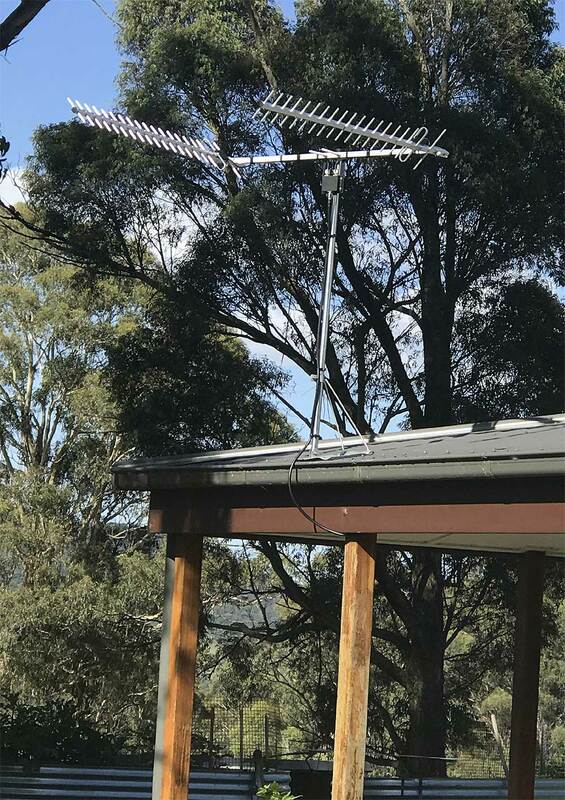 I use this antenna in Dalton NSW, literally in the middle of nowhere and I am impressed. We originally had a YAGI antenna fitted to the roof, but this never gave us more than 1 bar reliably. It got less reliable with time - maybe the trees grew! Although there is a Telstra tower within 10 km, the house is in a gully with hills around and there is very limited or no mobile coverage. A chance search on the web found your information, until then we had spent months trying to find someone who could offer a solution. With your G Spotter antenna we found that there was no position close to the house (within 10 m) that gave a reliable NextG signal. The next step was to search in close proximity to the house, we found two spots, both about 40 m from the house, that gave reliable 2 bars sometimes 3. We tried putting the G spotter antenna up higher, but in the end it was best only 2 m off the ground. 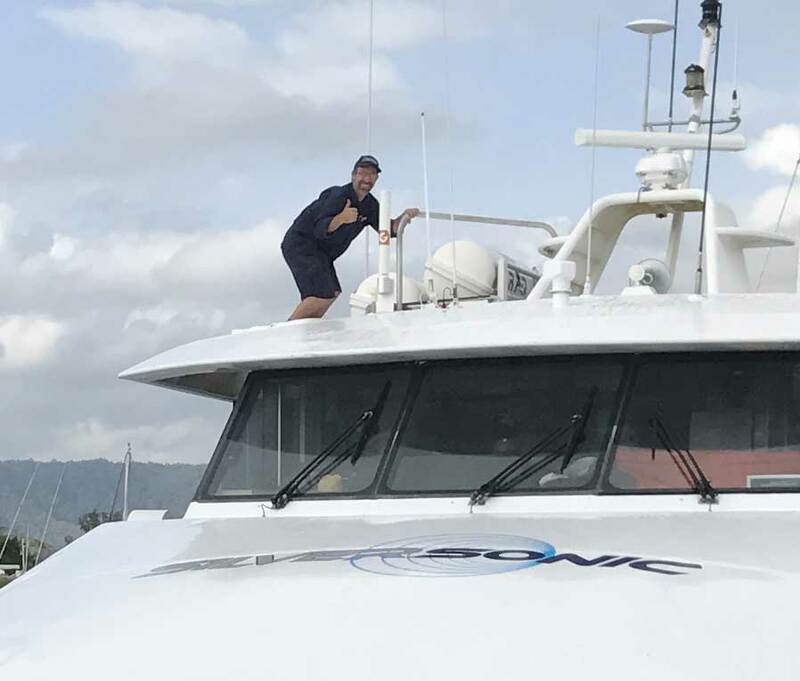 We then set up the Telstra wireless router and the WIFI antenna, access to an outside 240 v power point was only a few metres away. This has given us an excellent signal into the house. Now we can run two computers at once from anywhere in the house. Everyone is happy! Thanks for your help,we could not fault your service! Hi Dave, The antenna package arrived Monday morning and today it's up and connected. We get a better signal strength. Before the antenna I could only get fluctuating signal between Zero,1 & 2 bars. Now it is 4 and steady. Thanks again. Just a quick word of thanks in relation to the recent purchase of the G Spotter. 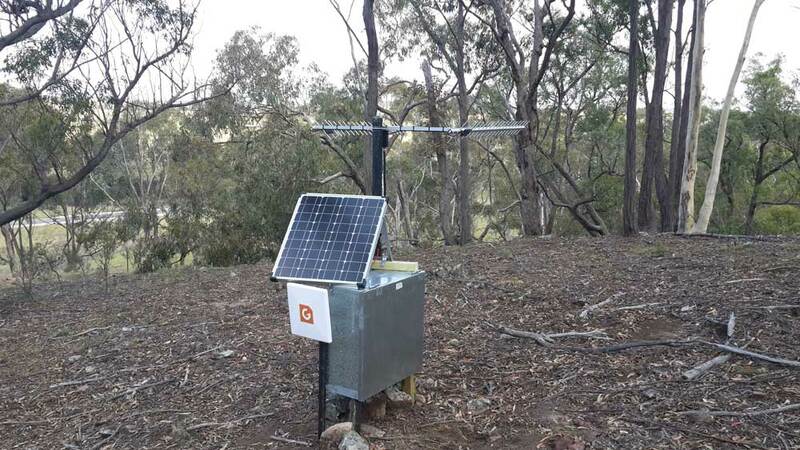 As we live in a remote rural location in WA we are delighted at the increased performance of our communications having installed the G Spotter recently. Signal strength is now up to high on a regular basis, there are less interruptions to signal strength and performance has increased by 50% many thanks for a top product. Thank you for the prompt delivery of the 'G-Spotter'. Tried it at Wallaga Lake and received 4 out of 5 bars in one spot on our verandah. The house is in a hollow close to the water so this is about a 200% improvement on normal reception. It is more than sufficient to use the internet connection for working purposes and downloaded a 13MB file without any problem at all. Hi all, well I got the "G spotter" and I am astounded. I had to point it in almost the complete opposite direction (of the tower), into some trees and directly into a mountain. Go figure! If I try to rig the sattelite dish I'll let yall know if it improves things. if I hadn't of come here for advice, I would have given up!!! " I use an external antenna mounted on a tripod. (a 3G Long Range Antenna from www.broadbandantennas.com.au )To share the 3G connection I use a Draytek Vigor2820n. This ADSL/Wifi router also has a USB port and displays the 3G radio reception signal strength in the browser. It redials the 3G connection on demand, if required. at least get a GPRS service to the outside world. If you can get a 3G service, adjusting the directional antenna can optimise it. 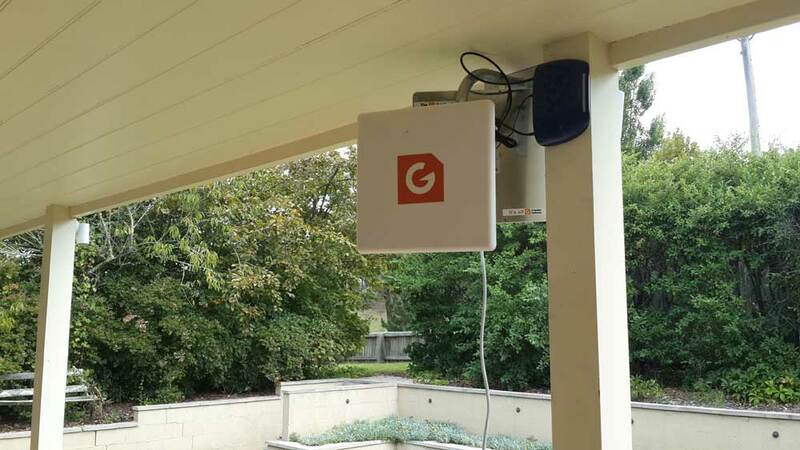 Just thought I would let you know that I received and installed the G Spotter yesterday (about 1.2m above a lean to roof). Did a speed test and got 1.42Mbps with 2 bars showing by just aligning up generally towards the Telstra tower 6K away. This is a mega improvement from previous "no bars, one bar sometimes", resulting in no internet connection whatsoever. Am very pleased with result. It seems to be quite a bit faster than my defunct satellite service also. Your line speed is 2.41 Mbps (2414 kbps). Your download speed is 302 KB/s (0.29 MB/s). In my experience this speed is approaching what you get at some the Internet cafés in town. I thought that I would give you a "results" report on the antenna I purchased from you a fortnight ago. As previously advised, When arriving home I attach it to a piece of gal pipe and walked around our cabin. I pickedup signal where none was available previously. Last weekend I took up a new mast, attached the antenna and went for a walk around our roof-top. Signal was available on about 80% of the roof-top area and I found a consistently stronger signal at one particular spot. Anyhow, I have brought the antenna cable into our cabin and now have a telephone service that ranges up to 2 bars on strength (I have seen a couple of flashes of 3 bars) and with good call quality in both transmit and receive. "Bluetooth" enables me to have the means of picking up a call from anywhere inside or near to the cabin without trailing the phone and cable around. I have lived for 8-9 years in a village located 45 west of Goulburn with a population of approx 300 in the locality. Approximately 3 years ago I made a decision to get the internet for my son's schooling purposes, communication and employment opportunities. As we had no broadband reception and satellite was expensive, my options were limited. 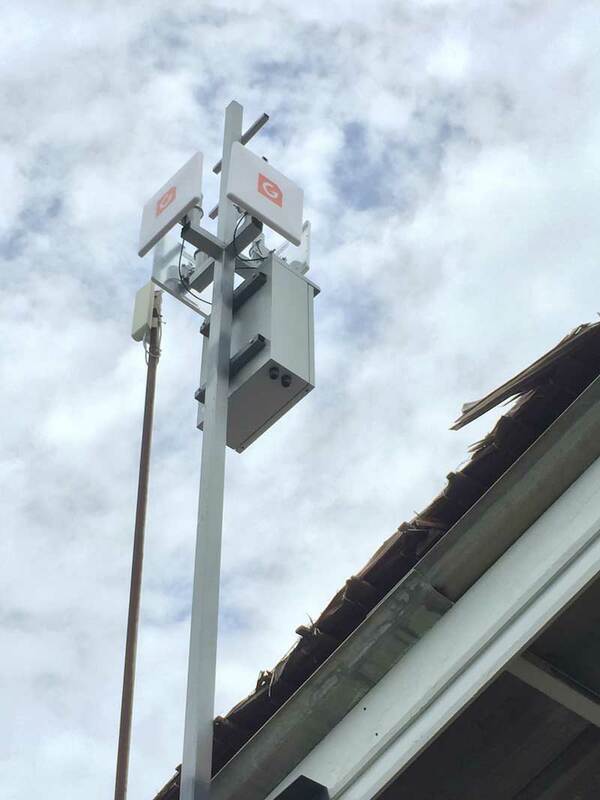 A service provider had opened in a nearby town and was providing their own towers with a wirefree network. I made enquiries and they came out and installed the aerial etc and I paid only $120 because of the government rebate. The majority of residents signed up as well. The service was reasonably reliable and fast. Approximately 12months ago, unbeknown to customers until we received a letter, they had moved to the north coast and sold out to another company. Since this company has taken over we have only 50% uptime at double the monthly cost. The customer service is virtually non existent and we are fed up. My son cannot rely on the internet for studies and one woman who is employed by a Sydney company faces losing her job as all her work is internet based. The inconvenience goes on. Many of us are looking for alternatives in frustration. One option we have is satellite. But to do so would incur $2500-3000 for set up as we have already used our government rebate. Then I was introduced to Dave and his directional aerial. I explained to him that I do not get Telstra signal and only minimal Optus. He offered to try his aerial. Upon testing my reception went from 0 to 5 bar coverage with Telstra and 2 to 5 bar coverage for Optus. With this aerial I will, with minimal cost in comparison, not only be able to choose what internet provider I can afford and prefer but I will finally be able to use my mobile phone. Thankfully, I will not be held hostage anymore by rogue internet providers and just because I choose to live in a rural environment does not mean that I cannot have the level of communication that others take for granted. 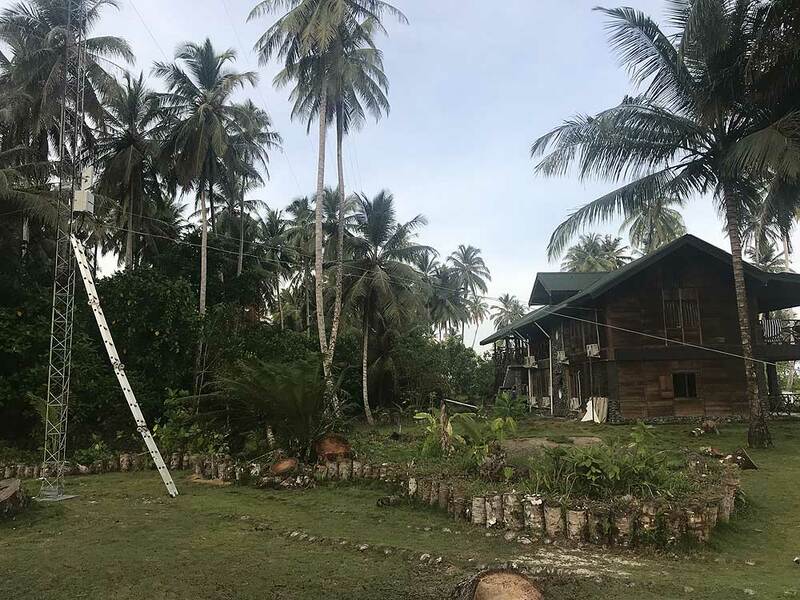 "Now I am getting around 15 Mbit of solid 4G, paired with high gain wifi antennas, I can use the internet and make wifi calls around the property." 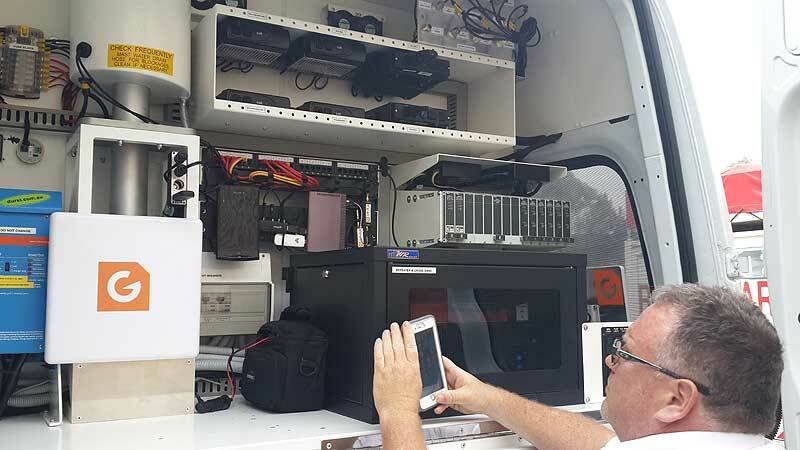 " Happy to report that I set up the Twin Peak Pro on the weekend and... instant 4G service! 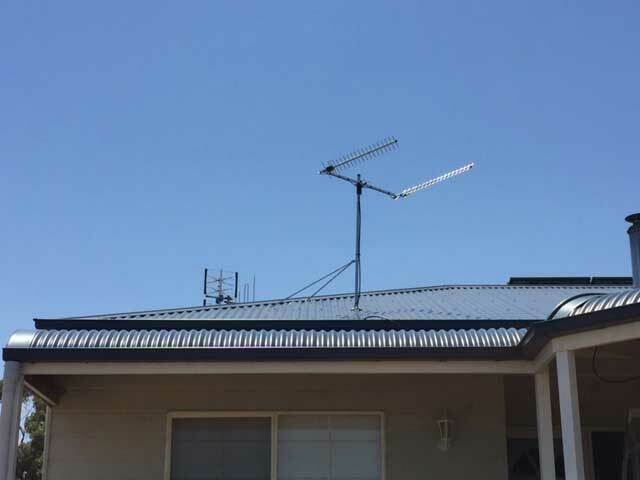 This aerial was a game changer for my property as I went from having zero service to 4G"
"The new True Blue G Spotter has been received.I picked up 4G with Optus from out of town and Very pleased with this result." "The True Blue antenna coupled with the WIFI antenna we purchased through you has been great. Easy to setup and the improvement to our internet and phone has been incredible. " 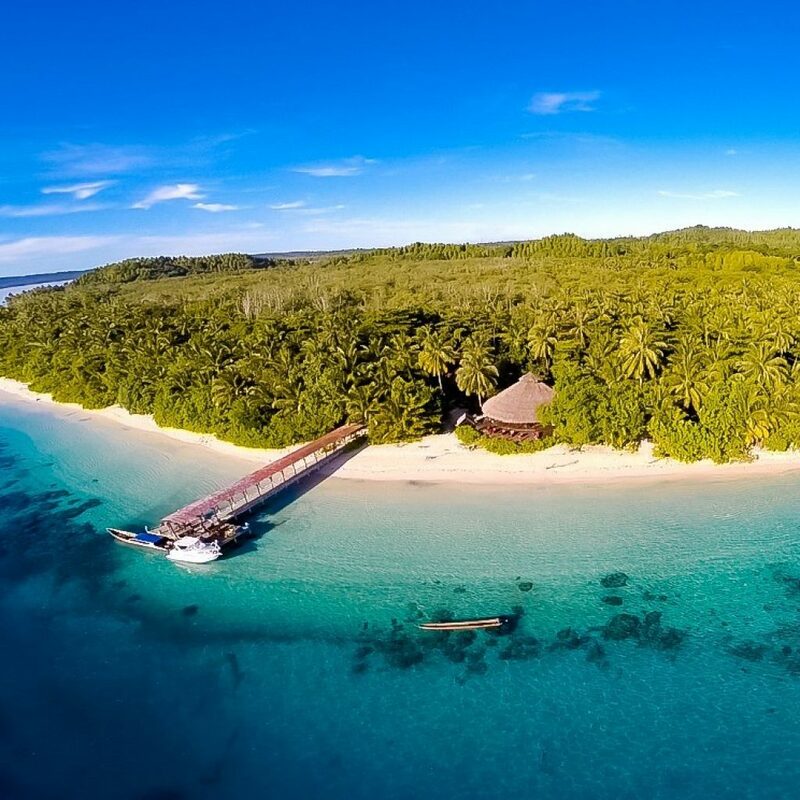 "Thanks to G Spotter Antennas our remote part of paradise has super fast 4G and extended WiFi." "We are more than impressed with the quality of the products supplied by Dave from G -spotter and Daves fantastic customer service. As a result of installing his system we have been able to achive data speeds we have never seen before and only ever dreamed of. 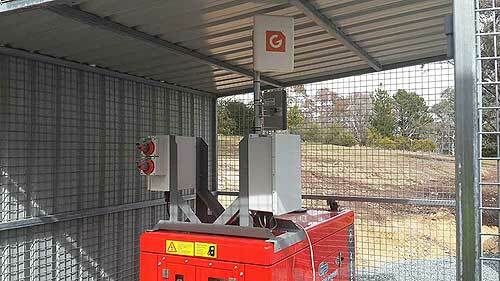 Satellite vs G Spotter the G Spotter system wins hands down. " "Dave has been great and I can't recommend him enough, he has helped us twice. 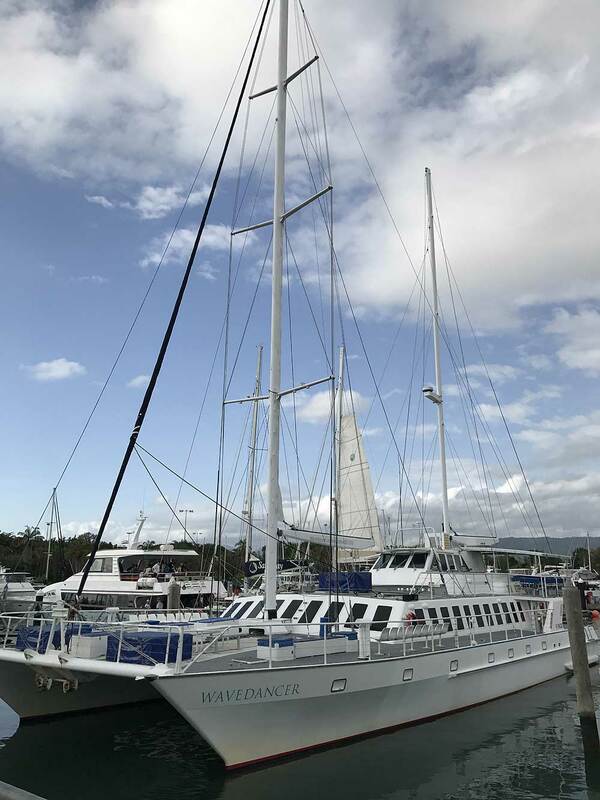 The first time was with our optus homewireless broadband... our service wasn't great and a quick phone call to Dave and a G spotter True blue aerial and it worked beautifully." 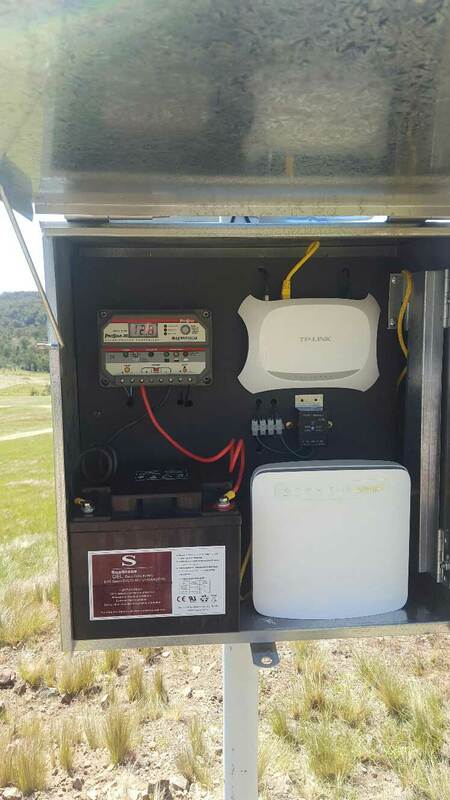 " I Love the Twin Peak Pro, gone from no signal to super fast broadband money well spent, thanks Dave"
"After following the recommendation to check outdoors for 4G reception and finding that there was a smidgen, I looked into and was advised to give G-Spotter a try. Glad I did! Dave was and is great to deal with and really helpful with advice.!" 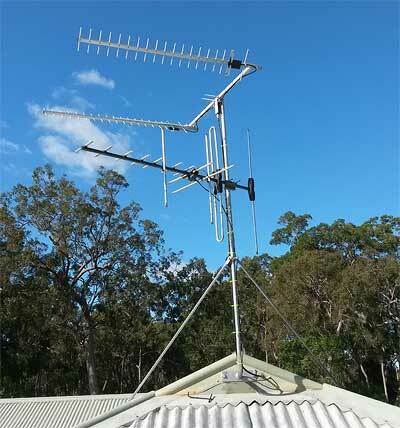 "Went from old yagi antenna on roof no bars to 4 bars with G Spotter Twin Peak Pro"
"Looking for a reliable solution for wifi connectivity on our remote processing site we came across Gspotter antennas.After a chat with Dave about our options and some practical real world examples he provided. We went ahead with a 4G wifi solution ." "Brilliant, consistently sits at high signal strength"
" 1 bar of 3G was a struggle but the Twin Peak Pro Antenna was receiving 4 bars.. ...It's great having the confidence to know that I have quality communications "
"I'm thrilled as I'm now consistently getting 4 out of 5 bars"